The aggregate market value of the voting and nonvoting common equity held by non-affiliates based on the closing price, as quoted on the NASDAQ as of March 31, 2011 (the last business day of Alicos most recently completed second fiscal quarter) was $63,444,231. There were 7,349,410 shares of stock outstanding at December 5, 2011. Portions of the Proxy Statement of Registrant to be dated on or before January 17, 2012, are incorporated by reference in Part III of this report. This annual report on Form 10-K contains statements which, to the extent that they do not recite historical fact, constitute forward-looking statements. These statements can be identified by the fact that they do not relate strictly to historical or current facts and may include the words may, will, could, should, would, believe, expect, anticipate, estimate, intend, plan or other words or expressions of similar meaning. We have based these forward-looking statements on our current expectations about future events. The forward-looking statements include statements that reflect managements beliefs, plans, objectives, goals, expectations, anticipations and intentions with respect to our financial condition, results of operations, future performance and business, including statements relating to our business strategy and our current and future development plans. In addition, this annual report on Form 10-K contains industry data related to our business and the markets in which we operate. This data includes projections that are based on a number of assumptions. If these assumptions turn out to be incorrect, actual results could differ from the projections. We urge you to carefully review this annual report on Form 10-K, particularly the section Risk Factors, for a complete discussion of the risks of an investment in our common stock. Although we believe that the expectations reflected in the forward-looking statements are reasonable, we cannot guarantee future results, level of activity, performance or achievements. Many factors discussed in this annual report, some of which are beyond our control, will be important in determining our future performance. Consequently, actual results may differ materially from those that might be anticipated from forward-looking statements. In light of these and other uncertainties, you should not regard the inclusion of a forward-looking statement in this annual report as a representation by us that our plans and objectives will be achieved, and you should not place undue reliance on such forward-looking statements. We undertake no obligation to publicly update any forward-looking statements, whether as a result of new information, future events or otherwise, except as required by law. As used throughout this Annual Report on Form 10-K, the terms Alico, the Company, we, our, or us include Alico, Inc. and its consolidated subsidiaries unless the context indicates otherwise. Alico, Inc. was formed February 29, 1960 as a spin-off of the Atlantic Coast Line Railroad Company. We are a land management company operating in Central and Southwest Florida. We own approximately 139,600 acres of land located in Collier, Glades, Hendry, Lee and Polk Counties. We combine a commitment to Florida agriculture with appropriate land management practices to maximize current income and to enhance the value of our real estate holdings. Alico is involved in a variety of agribusiness pursuits, principally, citrus production, sugarcane production and cattle ranching. Non-agricultural operations include leasing land for recreational, farming and grazing purposes, royalties from rock mining and real estate activities. Alicos land is managed for multiple uses wherever possible. For example, cattle ranching, forestry and land leased for recreation and oil exploration utilize the same acreage in some instances. We seek to maximize the strategic positioning of all company owned land. Our wholly owned subsidiary, Alico Land Development, Inc. (ALDI), formerly known as Saddlebag Lake Resort, Inc., is responsible for seeking and maintaining appropriate government entitlements to enhance or preserve development and other land use rights necessary to maximize land values. We regularly review our land holdings to determine the best use of each parcel. Land considered surplus to our agricultural operations may be sold or exchanged for land considered to be more compatible with our business objectives. Any land development or retail land sales activities are conducted solely by ALDI. Internal Revenue Service settlement in principle  The Internal Revenue Service (IRS) examined our tax returns for the 2005 through 2007 tax years. The IRS originally claimed additional taxes and penalties due of $31.1 million consisting of $14.5 million in taxes and $16.6 million in penalties. We contested the positions taken by the IRS and pursued resolution through the IRS Appeals process. On November 22, 2011, we reached an agreement in principle to settle the issues. Federal and state taxes and interest due as a result of the settlement are estimated at approximately $0.9 million and $0.7 million, respectively. Citrus Groves  Produced 4.1 million and sold 7.1 million boxes of citrus for the year ended September 30, 2011, as compared with 3.6 million boxes produced and 6.4 million boxes sold for fiscal 2010, an increase of 10.9% in boxes sold year-over-year. Citrus revenues were $83.2 million for the year ended September 30, 2011, as compared with $65.4 million for fiscal 2010, an increase of $17.8 million or 27.2% in year-over-year revenues. Sugarcane  Produced and sold 205,421 net standard tons of sugarcane for the year ended September 30, 2011, compared to 119,039 net standard tons for fiscal 2010, an increase of 72.6% in year-over-year production. Sugarcane revenues were $7.8 million for the year ended September 30, 2011, as compared with $4.1 million for fiscal 2010, an increase of $3.7 million or 90.3% in year-over year-revenues. Cattle  Cattle revenues were $4.6 million for the year ended September 30, 2011, as compared with $4.0 million for fiscal year 2010, an increase of 15% in year-over-year revenues. Gross profit from our cattle operations increased by $1.2 million or 445.6% for the year ended September 30, 2011, as compared with the year ended September 30, 2010. Entitlement of Alico West  We successfully obtained a Comprehensive Plan Amendment which allows for construction of up to 1,950 dwelling units and 1.5 million square feet of commercial/retail on the property to support the continued growth of Florida Gulf Coast University. 6,134 square feet and have leased 4,974 square feet to a third party. The remaining 11,980 square feet are available for lease. We sold our former corporate headquarters in LaBelle, Florida to the Board of County Commissioners of Hendry County, Florida. Bowen is a wholly owned subsidiary purchased in February 2006 to provide additional citrus marketing expertise and the ability to manage the delivery of our own citrus crop. Its operations include supply chain management for Alicos citrus crop as well as for other Florida growers. Bowens operations also include the purchase and resale of citrus fruit. During the fiscal years ended September 30, 2011, 2010, and 2009, Bowens revenue was 37%, 36% and 31% of our total operating revenue, respectively. Our Citrus Groves segment cultivates citrus trees to produce citrus for delivery to the fresh and processed citrus markets in the State of Florida. Citrus sales for processed juice constitute approximately 94.7% of our total citrus sales. Our groves are located in Hendry, Polk and Collier Counties, Florida. We sold approximately 42.4% of our citrus crop to Southern Gardens, a wholly owned subsidiary of U.S. Sugar Corporation (USSC), during the year ended September 30, 2011. We also had citrus contracts with Florida Orange Marketers, Inc. and Citrusuco which represented approximately 36.0% and 9.8% of our 2010-11 citrus sales, respectively. We believe that other markets are available for our citrus products; however, new arrangements may be less favorable than current contracts. Revenue from Citrus Groves operations was 48%, 46% and 40% of our total operating revenues for the fiscal years ended September 30, 2011, 2010 and 2009, respectively. Our sugarcane crops are grown in Hendry County, Florida. Sugarcane operations consist of cultivating raw sugarcane for sale to a sugar processor. We are members of a co-operative of sugarcane growers that is responsible for harvesting the crop. We harvested 6,433 acres, 3,463 acres and 8,307 acres of sugarcane during the fiscal years ended September 30, 2011, 2010 and 2009, respectively. We have sold 100% of our sugarcane to USSC, a local Florida sugar processor, since the inception of our sugarcane program in 1988. The location of our sugarcane fields relative to the USSC processing plant is favorable and allows for efficient and cost effective delivery of our sugarcane. Alternative plant locations are less favorable, and, as a result, the loss of USSC as a customer would have a material adverse effect on our sugarcane operations; however, we do have a purchase agreement with USSC through March 31, 2013. During fiscal years ended September 30, 2011, 2010 and 2009, revenue from sugarcane operations was 8%, 5% and 9% of our total operating revenue, respectively. Our Cattle operation is engaged primarily in the production of beef cattle. It is located in Hendry and Collier Counties, Florida. The breeding herd consists of approximately 8,476 cows and bulls. Approximately 42% of the herd is from one to five years old, while the remaining 58% is at least six years old. We primarily sell our calves to feed yards and yearling grazing operations in the United States. We also sell cattle through local livestock auction markets and to contract cattle buyers in the United States. These buyers provide ready markets for our cattle. We believe that the loss of any one or a few of these buyers would not have a material effect on Alicos Cattle operations. Revenue from cattle sales was 5% of total operating revenue for each of the years ended September 30, 2011 and 2010 and 9% for fiscal 2009. Alico is also engaged in the sale of native sod, plants and trees for landscaping purposes. The sales of these products are not significant to the overall revenue or profitability of the Company, accounting for less than 1% of the total operating revenues for the fiscal years ended September 30, 2011, 2010 and 2009. The Real Estate segment operated by ALDI is engaged in the planning and strategic positioning of all Alico land. ALDI was formed in 1971 to develop and sell residential subdivisions in Polk County, Florida. ALDI provides services to Alico which include seeking entitlement of our land assets in order to preserve rights should we choose to sell or develop the property in the future, and for negotiating and/or renegotiating sales and option contracts. ALDI is not currently engaged in any subdivision development; however, it owns 6 residential lots as of September 30, 2011, in Polk County, Florida. ALDI has been active in subdivision development and sale of real estate since its formation. ALDI has developed and sold subdivisions in Polk County, Florida. We continue our efforts to entitle and position strategic parcels of our real estate holdings for their best future use. As a result of these efforts, a development order has been issued for Winslow Pointe, a 268 acre lakefront parcel in Polk County, Florida which allows for 124,400 square feet of commercial/retail and 536 residential units along a major highway. Additionally, we were successful, through a Comprehensive Plan Amendment, in transferring a 919 acre parcel situated in close proximity to Florida Gulf Coast University and the Southwest Florida International Airport in Lee County Florida, from the Density Reduction Groundwater Recharge designation to the University Community Overlay land use category. The transfer of the parcel from its previous designation allows for construction of up to 1,950 dwelling units and 1.5 million square feet of commercial/retail on the property to support the continued student growth at Florida Gulf Coast University should such development occur. We assess and evaluate our land holdings on an on-going basis. Much of our land was acquired decades ago and, as a result, has a low cost basis. Land determined to be surplus to our agribusiness operations may be sold to generate income and cash flow or exchanged for land that is more compatible with our business objectives. We lease land to others on a tenant-at-will basis, for grazing, farming, oil exploration and recreational uses. Preparation of additional land for lease is subject to demand and alignment with overall strategic objectives. There were no significant changes in leasing operations during the past three fiscal years. During the fiscal years ended September 30, revenue from leasing activities was 2% for 2011 and 3% for 2010 and 2009, respectively, of our total operating revenues. We own and lease a 526 acre rock, sand and aggregate mine in Glades County, Florida. Materials mined from this site are suitable for road and other construction uses. We are actively seeking permits for two additional mines. One location is an 886 acre sand mine site in Hendry County, Florida. Potential uses of the sand include construction, concrete, masonry and beach restoration. The second location is a 1,382 acre aggregate mine site in Collier County. The aggregate would be potentially saleable for road and other construction purposes. Operating revenue and profits from mining operations have not been significant to our total revenue during the past three fiscal years. There is potential for increased revenue as the additional properties are permitted and become operational; however, this is subject to market demand for the mined products. Information regarding the revenues, earnings and total assets of each of our operating segments can be found in Note 15. Segment Information in Notes to our Consolidated Financial Statements included in this Annual Report. Substantially all of our revenues are generated from domestic customers. All of our assets are located in the United States. Our business strategy is based on sound land management practices and prudent stewardship of company owned lands. Our objective is to maximize the productivity and value of the land that we own and dispose of land that is surplus to our agricultural operations. Our agricultural businesses and proceeds from dispositions of surplus land generate cash flows that may be used to expand agricultural operations on company owned lands or the acquisition of additional lands suitable to our business. Our strategy includes continued evaluation of company owned land and expansion of agricultural operations to use properties that are not currently planted or producing income. We are continuing a program of replanting vacant sections of existing citrus groves to increase production and profitability. We have replanted approximately 843 acres of citrus in the past two years and expect to replant 440 acres in the next year. We would consider acquisitions of additional citrus producing properties subject to various factors including location, land characteristics and availability of capital. We are currently planting approximately 500 additional acres of sugarcane, and our plans call for continued expansion for the next two years. Alico is engaged in a variety of agricultural and nonagricultural activities, all of which are in highly competitive markets. Citrus is grown domestically in several states including Florida, California, and Texas, as well as foreign countries, most notably Brazil. Competition is impacted by several factors including production, market prices, weather, disease, and currency exchange rates. Sugarcane products compete with sugar beets in the United States as well as imported sugar and sugar products from Brazil and Mexico. Beef cattle are produced throughout the United States and domestic beef sales also compete with imported beef. Forest and rock products are produced in many parts of the United States. The sale and leasing of land is very competitive in the counties where we own land. The degree of competition has increased due to the current economic climate, which has caused an oversupply of comparable real estate available for sale or lease due to the decline in demand as a result of the continuing downturn in the economy. Our operations are subject to various federal, state and local laws regulating the discharge of materials into the environment. Management believes we are in compliance with all such rules including permitting and reporting requirements. Compliance has not had a material effect upon our financial position, results of operations and cash flows. Management monitors environmental legislation and requirements and makes every effort to remain in compliance with such regulations. In addition, we require lessees of our property to comply with environmental regulations as a condition of leasing. Revenues from Alicos agri-business operations are seasonal in nature. The harvest and sale of citrus fruit generally occurs in all quarters, but is more concentrated during the first, second and third fiscal quarters. Sugarcane is traditionally harvested during the first and second fiscal quarters. The majority of our cattle sales occur in the third and fourth fiscal quarters. Other segments of Alicos business such as mining and leasing operations tend to be less seasonal in nature. Management believes that Alico will be able to meet its working capital requirements for the foreseeable future through internally generated funds and our existing credit line. Alico has credit commitments that provide for revolving credit that is available for our general use. Raw materials needed to cultivate the various crops grown by Alico consist primarily of fertilizers, herbicides and fuel and are readily available from local suppliers. Our most recent Annual Report on Form 10-K, Quarterly Reports on Form 10-Q, Current Reports on Form 8-K, and any amendments to those reports may be viewed or downloaded electronically, free of charge, from our website http://www.alicoinc.com as soon as reasonably practicable after we electronically file such material with, or furnish it to, the Securities and Exchange Commission (SEC). In addition, you may read and copy any materials we file with SEC at the SECs Public Reference Room at 100 F Street, NE, Washington, DC 20549. To obtain information on the operation of the Public Reference room, you may call the SEC at 1-800-SEC-0330. Our recent press releases are also available to be viewed or downloaded electronically at http://www.alicoinc.com. We will also provide electronic copies of our SEC filings free of charge upon request. Any information posted on or linked from our website is not incorporated by reference into this Annual Report on Form 10-K. The SEC also maintains a website at http://sec.gov, which contains reports, proxy and information statements and other information regarding issuers that file electronically with the SEC. Our operations involve varying degrees of risk and each investor should consider the specific risks and speculative features inherent in and affecting our business before investing in Alico. In considering the following risk and speculative factors, an investor should realize that there is a possibility of losing the entire investment. Our financial condition and results of operations could be affected by the risk factors discussed below. These factors may also cause actual results to differ materially from the results contemplated by the forward looking statements in Item 7. Managements Discussion and Analysis of Financial Condition and Results of Operations. Alico has a 51% stockholder and a limited public float which could adversely affect the price of its stock and restrict the ability of the minority shareholders to have a voice in corporate governance. Atlantic Blue Group, Inc. (Atlanticblue) (formerly Atlantic Blue Trust, Inc.) is the owner of approximately 51% of Alicos common stock. Accordingly, our common stock is thinly traded and its market price may fluctuate significantly more than stocks with a larger public float. Additionally, by virtue of its ownership percentage, Atlanticblue is able to elect all the directors, appoint all of the officers and management, and, consequently, is considered to control Alico. While Atlanticblue has issued a governance letter dated December 3, 2009 reaffirming its commitment to maintaining a majority of independent directors on Alicos Board of Directors, this commitment may be terminated at any time upon 30 days prior written notice. Alicos Board of Directors and its Committees establish governance procedures and guidelines designed to attract and retain quality directors. Due to the resignations of two directors in 2010, directors independent of Atlanticblue (non-affiliated directors) did not constitute a majority throughout most of the fiscal year ended September 30, 2010. In October 2010, a fifth non-affiliated director was appointed reestablishing a majority of non-affiliated independent directors. Alico does not have cumulative voting. Accordingly, stockholders of Alico, other than Atlanticblue, have no effective control over who the management and directors of Alico are or will be. Our tax returns have been subject to frequent examinations by the IRS. We use a large national accounting firm to prepare our tax returns, and we review the positions taken on such returns quarterly with our accountants and legal counsel; however, the IRS has taken several positions contrary to ours. The IRS examined our tax returns for the 2005 through 2007 tax years. The IRS principally challenged (i) Agri-Insurances ability to elect to be treated as a United States taxpayer during the years under examination; and (ii) Alico-Agris ability to recognize income from two real estate sales under the installment method by asserting that Alico-Agri was a dealer in real estate during the years under examination. The IRS claimed additional taxes and penalties due of $31.1 million consisting of $14.5 million in taxes and $16.6 million in penalties but did not quantify the interest on the taxes. We contested the positions taken by the IRS and pursued resolution through the IRS Appeals process. On November 22, 2011, we reached an agreement in principle to settle the issues. The settlement provides that Agri-Insurance was eligible to elect to be treated as a United States taxpayer. No determination was made as to whether Alico or Alico-Agri was a dealer in real estate; however, for the two sales transactions at issue, we agreed to treat one-third of the taxable gain as ordinary income taxable in the year of sale with the remaining two-thirds treated as capital gain eligible for installment sale treatment. Federal and state taxes and interest due as a result of the settlement are estimated at approximately $0.9 million and $0.7 million, respectively and have been accrued at September 30, 2011. Federal penalties of $15.3 million were considered by Appeals and have been waived. The remaining $1.3 million in penalties have not yet been considered by Appeals to date but waiver of these penalties would be consistent with the issues resolved in the settlement. The settlement does not preclude Alico from using the installment sale method with respect to future transactions. See Item 3. Legal Proceedings, Note 12. Income Taxes and Note 18. Subsequent Events in the Notes to Consolidated Financial Statements. Alico has a large customer that accounts for 28% of revenues. For the fiscal year ended September 30, 2011, Alicos largest customer accounted for approximately 28% of operating revenue. Our largest customer is USSC, to whom we produce sugarcane. Additionally, we sell citrus to Southern Gardens, a wholly owned subsidiary of USSC. While Alico believes that it can replace these arrangements with other marketing alternatives, it may not be able to do so quickly and the results may not be as favorable as the current contracts. Alico manages its properties in an attempt to capture its highest and best use and customarily does not sell property until it determines that the property is surplus to its agricultural activities or has greater potential for industrial, commercial or residential use. Alico has little control over the timing of real estate sales as they are primarily market driven. potential liability under environmental and other laws. Alico is not able to predict when its properties will become best suited for non-agricultural use and has limited ability to influence this process. Additionally, changes from time to time in any or a combination of these factors could result in delays in sales opportunities. Alicos ability to sell tracts which are determined to be surplus or its ability to realize optimum pricing from such sales is therefore uncertain. Alico is subject to environmental liability by virtue of owning significant holdings of real estate assets. We face a potential for environmental liability by virtue of our ownership of real property. If hazardous substances (including herbicides and pesticides used by us or by any persons leasing our lands) are discovered on or emanating from any of our lands and the release of such substances presents a threat of harm to the public health or the environment, we may be held strictly liable for the cost of remediation of these hazardous substances. In addition, environmental laws that apply to a given site can vary greatly according to the sites location, its present and former uses, and other factors such as the presence of wetlands or endangered species on the site. Management monitors environmental legislation and requirements and makes every effort to remain in compliance with such regulations. Furthermore, Alico requires lessees of its properties to comply with environmental regulations as a condition of leasing. We also purchase insurance for environmental liability when it is available; however, these insurance contracts may not be adequate to cover such costs or damages or may not continue to be available to us at prices and terms that would be satisfactory. It is possible that in some cases the cost of compliance with these environmental laws could exceed the value of a particular tract of land or be significant enough that it would have a materially adverse effect on us. We have experienced significant turnover in Board and Management positions during the past several years. We seek to mitigate the impacts of turnover by establishing minimum requirements for each position and through the interview process. We attempt to hire qualified personnel and provide competitive compensation, benefit programs and a pleasant working environment to offset this risk. While we believe that we have retained experienced and qualified replacements, interruptions in the development and execution of our business plans, lack of familiarity with the design and execution of surrounding internal control systems and our operations might cause us to experience difficulties in these areas which could have a material adverse effect. Agricultural operations provide the majority of our operating revenues. Agriculture operations are subject to a wide variety of risks including product pricing due to variations in supply and demand, weather, disease, input costs and product liability. Agricultural products are subject to supply and demand pricing which is not predictable. Because our agricultural products are commodities with fluctuating market values, we are not able to predict with certainty what prices we will receive for our products; however, the costs are relatively fixed and the growth cycle of such products in many instances dictates when such products must be marketed which may or may not be advantageous in obtaining the best price. Excessive supplies tend to cause severe price competition and lower prices for the commodity affected. Conversely, shortages may cause higher prices. Shortages often result from adverse growing conditions which can reduce the available product in affected growing areas while not affecting others in non-affected growing areas. Alico attempts to mitigate these risks by using contracts with citrus processors that include pricing structures based on a minimum (floor) price and with a price increase (rise) if market conditions exceed the floor price. We cannot accurately predict or control what our profits or losses from agricultural operations will be from year-to-year. Alicos agricultural assets are concentrated and the effects of adverse weather conditions such as hurricanes can be magnified. Our agricultural operations are concentrated in counties in south Florida with more than 80% of our agricultural lands located in a contiguous parcel in Hendry County. All of these areas are subject to occasional periods of drought, flooding and freeze. Crops require water in different quantities at different times during the growth cycle. Accordingly, too much or too little water at any given point can adversely impact production. While we attempt to mitigate controllable weather risks through water management and crop selection, our ability to do so is limited. Our operations in south and central Florida are also subject to the risk of hurricanes. Hurricanes have the potential to destroy crops, affect cattle breeding and impact citrus and sugarcane production through the loss of fruit and destruction of trees and/or plants either as a result of high winds or through the spread of windblown disease. We were negatively impacted by hurricanes during fiscal years 2005 and 2004 and sustained losses relating to the storms during those two fiscal years. Alico seeks to minimize hurricane risk by the purchase of insurance contracts, but a portion of our crops remains uninsured. Because our agricultural properties are located in relative close proximity to each other, the impact of adverse weather conditions may be material to Alicos results of operations. Alicos agricultural earnings comprise a major portion of its revenues and are subject to wide volatility which could result in breaches of loan covenants. Borrowing capacity represents a major source of our working capital. We currently have a credit facility with Rabo AgriFinance, Inc. that includes a Revolving Line of Credit and a Term Loan. These loans are subject to covenants requiring Alico to maintain a minimum current ratio of 2.0:1, a debt ratio no greater than 60%, tangible net worth of at least $80 million, and a minimum debt coverage ratio of 1.15:1. While we currently expect to remain in compliance with these covenants, because of the volatility of our earnings stream and the factors causing this volatility, we are unable to directly control compliance with these covenants. In March 2010, Alico received a one-time waiver of the debt coverage ratio requirement from its previous lender, Farm Credit of Southwest Florida, in response to a freeze which damaged crops and affected the timing of their harvest. We believe that, based on factors currently known, we will continue to remain in compliance with our covenants for the next several years. We negotiated a less restrictive debt coverage ratio covenant to provide that the covenant must be breached in two consecutive years in order to be considered an event of default. Nevertheless, due to earnings volatility and factors unknown to us at this time, it is possible that a loan covenant could be breached, a default occur, and the major portion of our borrowings become due which could have a material adverse impact on our financial condition, results of operations and cash flows. Water Use Regulation restricts Alicos access to water for agricultural use. Our agricultural operations are dependent upon the availability of adequate surface and underground water. The availability of water for use in irrigation is regulated by the State of Florida through water management districts which have jurisdiction over various geographic regions in which our lands are located. Currently, we have permits for the use of underground and surface water which are adequate for our agricultural needs. Surface water in Hendry County, where much of our agricultural land is located, comes from Lake Okeechobee via the Caloosahatchee River and the system of canals used to irrigate such land. The Army Corps of Engineers controls the level of Lake Okeechobee and ultimately determines the availability of surface water even though the use of water has been permitted by the State of Florida through the water management district. The Army Corps of Engineers decided in 2010 to lower the permissible level of Lake Okeechobee in response to concerns about the ability of the levee surrounding the lake to restrain rising waters which could result from hurricanes. Changes in permitting for underground or surface water use during times of drought, because of lower lake levels, may result in shortages of water for agricultural use and could have a materially adverse effect on our agricultural operations and financial results. Our citrus groves are subject to damage and loss from diseases such as Citrus Canker and Citrus Greening. Each of these diseases is widespread in Florida and exists in areas where our groves are located. Citrus Canker is spread by contact with infected trees or by windblown transmission. There is no known cure for Citrus Canker at the present time although some management practices can mitigate its spread and lessen its effect on infected trees; however, there is no assurance that available technologies to control such disease will be effective. Citrus Greening decreases the productivity of infected trees and is spread by insects known as Asian Citrus Psyillids. Alico uses a pesticide program to control these vectors and an enhanced foliar nutritional program to mitigate the damage to infected trees. At the present time, there is no known cure for Citrus Greening once trees are infected. We use best management practices to attempt to control diseases and their spread. Both of these diseases pose a significant threat to the Florida Citrus industry and to our citrus groves. We are managing the affects and the spread of these diseases in our groves which, left unmanaged, could cause a material adverse effect to our citrus grove operations, financial position and results of operations. Use of pesticides and herbicides and other materials by Alico or its lessees could create liability for Alico. materials; however, we do not have full knowledge or control over the chemicals used by third parties who lease our lands for cultivation. It is possible that some of these herbicides and pesticides could be harmful to humans if used improperly or that there may be unknown hazards associated with such chemicals despite any contrary government or manufacturer labels. We might have to pay the costs or damages associated with the improper application, accidental release or the use or misuse of such substances, which could have a materially adverse effect. Changes in immigration laws or enforcement of such laws could impact the ability of Alico to harvest its crops. We engage third parties to provide personnel for our harvesting operations. The availability and number of such workers is subject to decrease if there are changes in the U.S. immigration laws or by stricter enforcement of such laws. The scarcity of available personnel to harvest our agricultural products could cause harvesting costs to increase or could lead to the loss of product that is not timely harvested which could have a materially adverse effect. Changing public perceptions regarding the quality, safety or health risks of Alicos agricultural products can affect demand and pricing of such products. The general publics perception regarding the quality, safety or health risks associated with particular food crops we grow and sell could reduce demand and prices for some of our products. To the extent that consumer preferences evolve away from products we produce for health or other reasons, and we are unable to modify our products or develop products that satisfy new customer preferences, there could be decreased demand for our products. Even if market prices are unfavorable, produce items which are ready to be or have been harvested must be brought to market. Additionally, we have significant investments in our citrus groves and sugarcane fields and cannot easily shift to alternative crops for this land. A decrease in the selling price received for our products due to the factors described above could have a materially adverse effect on Alico. Alico faces significant competition in its agricultural operations. Alico faces significant competition in its agricultural operations both from domestic and foreign producers and does not have any branded products. Foreign growers generally have an equal or lower cost of production, less environmental regulation and in some instances, greater resources and market flexibility than Alico. Because foreign growers have great flexibility as to when they enter the U.S. market, we cannot always predict the impact these competitors will have on our business and results of operations. The competition we face from foreign suppliers of sugar and orange juice is mitigated by quota restrictions on sugar imports imposed by the U.S. government and by a governmentally imposed tariff on orange imports. A change in the governments sugar policy allowing more imports or a reduction in the orange juice tariff could adversely impact our results of operations. (1) Approximately 72,837 acres of the properties listed are encumbered by credit agreements with total credit availability of $46.0 million at September 30, 2011. For a more detailed description of the agreements and collateral please see Note 10. Long-Term Debt in the Notes to the Consolidated Financial Statements. (2) Cattle also graze approximately 40,000 acres of property listed as recreational leases. (3) Harvested acres during fiscal year 2011. One of our primary goals is to manage and selectively improve our properties for the best and most profitable use. We engage in detailed studies of the properties focusing on location, soil capabilities, sub-surface composition, topography, transportation, real estate parcels, availability of markets for our crops and products and the climatic characteristics of each of the tracts. The use of each tract is determined based on these studies. Management believes that our lands are suitable for agricultural, residential and commercial uses. Sales of property occur when, in the opinion of management, the sale of such property will provide the maximum value to our shareholders. ALDI uses third-party consultants to work with senior management and the Board of Directors to enhance the planning, entitlement and strategic positioning of our land. ALDI also oversees the entitlement of Alicos land assets in order to preserve and enhance property rights and maximize land values. Management believes that each of the major agricultural programs is adequately supported by equipment, buildings, fences, irrigation systems, drainage systems and other amenities required for our business operations. additional mines, one for an 886 acre parcel in Hendry County to be used as sand mine and the other for a potential 1,382 aggregate mine in Collier County. The Hendry County parcel is currently classified as leased property, while the Collier County parcel is classified as citrus. Based on initial estimates by third party engineering firms, the aggregate reserve of the Glades County parcel is approximately 26 million tons, the sand reserve of the Hendry County parcel is approximately 53 million tons and the aggregate reserve of the Collier County parcel is approximately 140 million tons. On October 29, 2008, Alico was served with a shareholder derivative action complaint filed by Baxter Troutman against JD Alexander and John R. Alexander which names Alico as a nominal defendant. Mr. Troutman is the cousin and nephew of the two defendants, respectively, and is a shareholder in Atlantic Blue Group, Inc. (formerly Atlantic Blue Trust, Inc.) (Atlanticblue), a 51% shareholder of Alico. From February 26, 2004 until January 18, 2008, Mr. Troutman was a director of Alico. The complaint alleges that JD Alexander and John R. Alexander committed breaches of fiduciary duty in connection with a proposed merger of Atlanticblue into Alico which was proposed in 2004 and withdrawn by Atlanticblue in 2005. The suit also alleges, among other things, that the merger proposal was wrongly requested by defendants JD Alexander and John R. Alexander (the Alexanders) and improperly included a proposed special dividend; and that the Alexanders sought to circumvent the Boards nominating process to ensure that they constituted a substantial part of Alicos senior management team and these actions were contrary to the position of Alicos independent directors at the time causing a waste of Alicos funds and the resignations of the independent directors in 2005. As a result, the complaint is seeking damages to be paid to Alico by the Alexanders in excess of $1.0 million. The complaint concedes that Mr. Troutman has not previously made demand upon Alico to take action for the alleged wrongdoing as required by Florida law alleging that he believed such a demand would be futile. A copy of the complaint may be obtained from the Clerk of the Circuit Court in Polk County, Florida. On June 3, 2009, a Special Committee of Independent Directors from Alicos Board of Directors, the (Committee) was created to investigate the shareholder derivative action filed by Mr. Troutman. The Committee completed its investigation with the assistance of independent legal counsel and determined that it would not be in the Companys best interest to pursue such litigation. Alico filed a motion to dismiss the litigation based upon the findings of the Special Committee; a hearing on this motion was held on December 7, 2010. The Court issued an order denying the motion to dismiss the shareholder derivative suit on May 24, 2011. A copy of the report, the order of denial and other pleadings in the case are available from the Clerk of Circuit Court in Polk County, Florida by reference to the matter of Baxter G. Troutman, Plaintiff vs. John R. Alexander, John D. Alexander, Defendants and Alico, Inc., Nominal Defendant, Case No. 08-CA-10178 Circuit Court, 10th Judicial Circuit, Polk County, Florida. JD Alexander and John R. Alexander filed a motion to dismiss the shareholder derivative action complaint filed by Baxter Troutman. On November 21, 2011, the Circuit Court in Polk County, Florida issued an order dismissing the shareholder derivative action. The court dismissed the complaint for failing to state a cause of action. The complaint was dismissed without prejudice and can be amended no later than December 16, 2011. The Company establishes estimated accruals for litigation matters which meet the requirements of ASC 450Contingencies. Based upon available information, the Company believes that the resolution of such matters will not have a material adverse effect on its financial position or results of operations. In the fiscal years ended September 30, 2011 and 2010, the IRS issued five Revenue Agent Reports (RAR) pursuant to its examinations of Alico, Agri-Insurance and Alico-Agri for the tax years 2005 through 2007. These RARs principally challenge: (i) Agri-Insurances ability to elect to be treated as a United States taxpayer during the years under examination; and (ii) Alico-Agris ability to recognize income from two real estate sales under the installment method by asserting that Alico-Agri was a dealer in real estate during the years under examination. Based on the positions taken in the RARs, the IRS claimed additional taxes and penalties due of $31.1 million, consisting of $14.5 million in taxes and $16.6 million in penalties. The RARs did not quantify the interest on the taxes. We contested the positions taken in the RARs and pursued resolution through the IRS Appeals process. On November 22, 2011, we reached an agreement in principle to settle the issues. The settlement provides that Agri-Insurance was eligible to elect to be treated as a United States taxpayer. No determination was made as to whether Alico or Alico-Agri was a dealer in real estate; however, for the two sales transactions at issue, we agreed to treat one-third of the taxable gain as ordinary income taxable in the year of sale with the remaining two-thirds treated as capital gain eligible for installment sale treatment. Federal and state taxes and interest due as a result of the settlement are estimated at approximately $0.9 million and $0.7 million, respectively and have been accrued at September 30, 2011. However, the estimated effect on income tax expense for the year ended September 30, 2011, is only $0.6 million due to the reversal of temporary differences. Federal penalties of $15.3 million were considered by IRS Appeals and have been waived. The remaining $1.3 million in penalties have not yet been considered by IRS Appeals to date but waiver of these penalties would be consistent with the issues resolved in the settlement. The estimated taxes and interest due are subject to final computation and confirmation by the IRS. The settlement does not preclude us from using the installment sale method with respect to future transactions. See Note 12. Income Taxes and Note 18. Subsequent Events in the Notes to Consolidated Financial Statements. On October 31, 2011 there were approximately 349 holders of our common stock. The number of registered holders includes banks and brokers who act as nominee, each of who may represent more than one stockholder. The following table presents cash dividends per common share declared in fiscal years 2011, 2010 and 2009 and paid in fiscal years 2012, 2011 and 2010. (a) The dividend was declared on September 29, 2011, during fiscal 2011, although the record date and payment date are in fiscal 2012. The Board of Directors intend to reinstate the quarterly dividend policy as of the first quarter of 2012. The graph below represents our common stock performance, comparing the value of $100 invested on September 1, 2006 in our common stock, the S&P 500 and a Company-constructed peer group. (a) The new peer group was selected to present a better comparison with our current business operations. On November 3, 1998, we adopted the Alico, Inc. Incentive Equity Plan (the 1998 Plan) pursuant to which our Board of Directors could grant options, stock appreciation rights and/or restricted stock to certain directors and employees. The 1998 Plan authorized grants of shares or options to purchase up to 650,000 shares of authorized but unissued common stock. This plan expired on November 3, 2008. On February 20, 2009, our shareholders approved the Alico, Inc., Incentive Equity Plan (the 2008 Plan) with an effective date of November 1, 2008. In accordance with the 2008 Plan, the Board of Directors may grant options, stock appreciation rights, and/or restricted stock to certain directors and employees. The 2008 Plan authorized grants of shares or options to purchase up to 350,000 shares of outstanding shares of common stock reacquired by us in the open market and held as treasury shares. In accordance with our 2008 Plan, the Board of Directors may authorize the purchase of our outstanding common stock. Stock repurchases can be made on a quarterly basis until November 1, 2013, through open market transactions, at times and in such amounts as our brokers determine, subject to the provisions of SEC Rule 10b-18. We have repurchased 77,246 shares of our common stock at a cost of $862,000 under the 2008 Plan and remain authorized to repurchase an additional 272,754 shares. The following table describes our purchases of our common stock during the fourth quarter of 2011. We do not anticipate that any purchases under the 2008 Plan will be made from any officer, director or control person. There are currently no arrangements with any person for the purchase of the shares. In accordance with the approved plan, we purchased 7,534, 32,268, 768 and 7,710 shares in the open market during the first, second, third and fourth quarters of fiscal year 2011, respectively, at a weighted average price of $24.96 per share, and 13,692, 2,308 and 7,466 shares in the open market during the first, second and fourth quarters of fiscal year 2010, respectively, at a weighted average price of $26.74 per share. (1) Beginning with fiscal year 2008, Alico changed its year end from August 31 to September 30. Results for September 30, 2007 are for the one month transition period created by the change. (2) During the fiscal year ended August 31, 2007, we revised our estimate in connection with a tax disagreement with the IRS which resulted in additional income tax expense of $25.6 million for that fiscal year. The effect of this revised estimate was to reduce income from continuing operations. Additionally, we used our revolving line of credit for funding to settle the dispute, causing long-term obligations to increase. (3) During the fiscal year ended September 30, 2009, we used cash to reduce our outstanding debt by approximately $59.5 million, causing a reduction in total assets and long-term obligations. (4) During the year ended September 30, 2011, we used cash to reduce our outstanding debt by approximately $16.3 million resulting in a reduction in total assets and long-term obligations. See Note 10. Long-Term Debt in the Notes to the Consolidated Financial Statements. We make forward-looking statements in this Annual Report, particularly in this Managements Discussion and Analysis, pursuant to the safe harbor provisions of the Private Securities Litigation Reform Act of 1995, Section 27A of the Securities Act of 1933 and Section 21E of the Securities Exchange Act of 1934, as amended (the Exchange Act). Any statements in this Annual Report that are not historical facts are forward-looking statements. Forward-looking statements include, but are not limited to, statements that express our intentions, beliefs, expectations, strategies, predictions or any other statements relating to our future activities or other future events or conditions. These statements are based on our current expectations, estimates and projections about our business based, in part, on assumptions made by our management. These assumptions are not guarantees of future performance and involve risks, uncertainties and assumptions that are difficult to predict. Therefore, actual outcomes and results may differ materially from what is expressed or forecasted in the forward-looking statements due to numerous factors, including those Risks Factors included in Part I, Item 1A and elsewhere in this Annual Report. We are a land management company operating in Central and Southwest Florida. Our primary asset is approximately 139,600 acres of land located in Collier, Glades, Hendry, Lee and Polk Counties. We are involved in a variety of agribusiness pursuits including citrus groves, sugarcane production, cattle ranching, land leasing, rock and sand mining and real estate sales activities. We have six reportable segments: Bowen Brothers Fruit (Bowen), Citrus Groves, Sugarcane, Cattle, Real Estate and Leasing. Bowen operations include supply chain management for both Alicos citrus crop and other growers in the State of Florida. Bowens operations also include the purchase and resale of citrus fruit. Citrus Groves operations consist of cultivating citrus trees in order to produce citrus fruit for delivery to the fresh and processed citrus markets in the State of Florida. Sugarcane operations consist of cultivating sugarcane for sale to a sugar processor. Cattle operations primarily include the production of beef cattle and the raising of replacement heifers. The Real Estate segment, operated by ALDI, is engaged in the planning and strategic positioning of all Alico land, which includes seeking entitlement of our land assets in order to preserve rights should we choose to sell or develop the property in the future and negotiating sales and options contracts. The Leasing segment leases land to others on a tenant-at-will basis for grazing, farming, oil and mineral exploration and recreational uses. We relocated our principal offices from LaBelle, Florida to Fort Myers, Florida during the third quarter of fiscal 2011. The preparation of financial statements and related disclosures in conformity with accounting principles generally accepted in the United States of America (GAAP) requires management to make estimates and judgments that affect the reported amounts of assets and liabilities, revenues and expenses, and related disclosures of contingent assets and liabilities. On an on-going basis, management evaluates the estimates and assumptions based upon historical experience and various other factors and circumstances. Management believes that the estimates and assumptions are reasonable in the circumstances; however, actual results may vary from these estimates and assumptions under different future circumstances. The following critical accounting policies have been identified that affect the more significant judgments and estimates used in the preparation of the consolidated financial statements. Revenue Recognition - Revenue from agricultural crops is recognized at the time the crop is harvested and delivered to the customer. Management reviews the reasonableness of the revenue accruals quarterly based on buyers and processors advances to growers, cash and futures markets and experience in the industry. Adjustments are made throughout the year to these estimates as more current relevant information regarding the specific markets become available. Differences between the estimates and the final realization of revenue can be significant and can be either positive or negative. During the periods presented in this report on Form 10-K, no material adjustments were made to the reported revenues of Alicos crops. Alico recognizes revenue from cattle sales at the time the cattle are sold. Alico recognizes revenue from the sale of vegetables and sod at the time of harvest and delivery to the customer. Bowens operations primarily consist of providing supply chain management services to Alico, as well as to other citrus growers and processors in the State of Florida. Bowen also purchases and resells citrus fruit; in these transactions, Bowen (i) acts as a principal; (ii) takes title to the products; and (iii) has the risks and rewards of ownership, including the risk of loss for collection, delivery or returns. Therefore, Bowen recognizes revenue based on the gross amounts due from customers for its marketing activities. Supply chain management services revenues are recognized when the services are performed. In recognizing revenue from land sales, Alico applies specific sales recognition criteria to determine when land sales revenue can be recorded. For example, in order to fully recognize gain resulting from a real estate transaction, the sale must be consummated with a down payment of at least 20% to 25% of the sales price depending upon the type and timeframe for development of the property sold, and any receivable from the sale cannot be subject to future subordination. In addition, the seller cannot retain any material continuing involvement in the property sold. When these criteria are not met, based on the estimated collectability of the receivable and sufficiency of any down payment, we recognize gain proportionate to collections utilizing either the installment method or deposit method as appropriate. Variable Interest and Equity Method Investments - We evaluate investments for which we do not hold an equity interest of at least 50% based on the amount of control we exercise over the operations of the investee, our exposure to losses in excess of our investment, our ability to significantly influence the investee and whether we are the primary beneficiary of the investee. In May 2010, we invested $12.2 million to obtain a 39% equity interest in Magnolia TC 2, LLC (Magnolia), a Florida limited liability company whose primary business activity is acquiring tax certificates issued by various counties in the State of Florida on properties which have been declared delinquent. Based on the criteria above, we are accounting for our investment in Magnolia in accordance with the equity method, whereby the investment in Magnolia is recorded as the line item, Investment in Magnolia, on our consolidated balance sheets, and changes in the account resulting from Magnolias prorated earnings or losses up to our initial investment are recognized as income or loss to us. Inventory - We capitalize the cost of growing crops into inventory until the time of harvest. Once a given crop is harvested, the related inventoried costs are recognized as a cost of sale to provide an appropriate matching of costs incurred with the related revenue recognized. We record inventory at the lower of cost or net realizable value. Management regularly assesses estimated inventory valuations based on current and forecasted usage of the related commodity, observable prices, estimated completion costs and other relevant factors that may affect the net realizable value. Property, Buildings and Equipment - Property, buildings and equipment are stated at cost, net of accumulated depreciation or amortization. Major improvements are capitalized while maintenance and repairs are expensed in the period the cost is incurred. Costs related to the development of citrus groves, through planting of trees, are capitalized. Such costs include land clearing, excavation and construction of ditches, dikes, roads, and reservoirs, among other costs. After the planting, caretaking costs or pre-productive maintenance costs are capitalized for four years. After four years, a grove is considered to have reached maturity and the accumulated costs, except for land excavation, are depreciated over 25 years. Costs related to the development of sugarcane are capitalized in a similar manner as citrus groves. However, sugarcane matures in one year and typically we will harvest an average of three crops (one per year) from one planting. As a result, cultivation and caretaking costs are expensed as the crop is harvested, while the development and planting costs are depreciated over three years. The breeding herd consists of purchased animals and animals raised on our ranch. Purchased animals are stated at the cost of acquisition. The cost of animals raised on the ranch is based on the accumulated cost of developing such animals for productive use. Impairment of Investments - We value our investments based on unadjusted quoted prices in active markets for investments identical to those to be reported at fair value. An active market is a market in which transactions occur for the item to be fair valued with sufficient frequency and volume to provide pricing information on an ongoing basis. When quoted prices for the specific investments are not available, we use inputs that are observable either directly or indirectly. 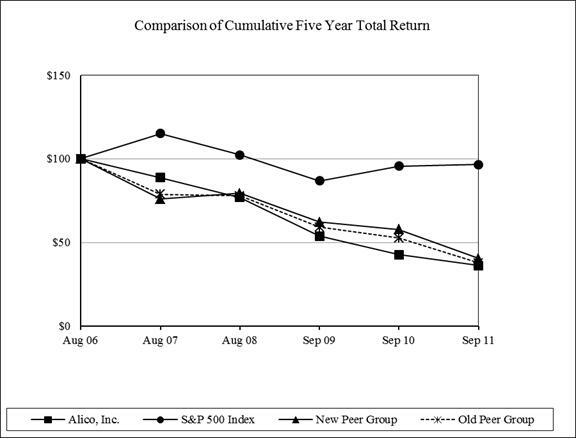 These inputs include: (a) quoted prices for similar investments in active markets; (b) quoted prices for identical or similar investments in markets that are not active, such as when there are few transactions for the asset or liability, the prices are not current, price quotations vary substantially over time or are among market makers (for example, some brokered markets), or in which little information is released publicly (for example, a principal-to-principal market); (c) inputs other than quoted prices that are observable for the investment (for example, interest rates and yield curves observable at commonly quoted intervals, volatilities, timing and frequency of prepayments, loss severities, credit risks, and default rates); and (d) inputs that are derived principally from or corroborated by observable market data by correlation or other means. Unobservable inputs for an investment are used to determine fair value only when observable inputs are not available. Unobservable inputs are developed based on the best information available in the circumstances, which include Alicos own data and assumptions that market participants would use in pricing the security. Unrealized gains and losses determined to be temporary are recorded as other comprehensive income, net of related deferred taxes, until realized. Unrealized losses determined to be other than temporary are recognized in the statement of operations during the period the determination is made. Impairment of Long-Lived Assets - We evaluate property, improvements, buildings, cattle, equipment and other long-lived assets for impairment when events or changes in circumstances (triggering events) indicate that the carrying value of assets contained in our financial statements may not be recoverable. The impairment calculation compares the carrying value of the asset to the assets estimated future cash flows (undiscounted and without interest charges). We recognize an impairment loss if the amount of the assets carrying value exceeds the assets estimated fair value. If an impairment loss is recognized, the adjusted carrying amount of the asset becomes its cost basis. For a depreciable long-lived asset, the new cost basis will be depreciated or amortized over the remaining useful life of that asset. Income Taxes - Deferred income taxes are recognized for the income tax effect of temporary differences between financial statement carrying amounts and the income tax bases of assets and liabilities. We regularly review our deferred income tax assets to determine whether future taxable income will be sufficient to realize the benefits of these assets. A valuation allowance is provided for deferred income tax assets for which it is deemed, more likely than not, that future taxable income will not be sufficient to realize the related income tax benefits from these assets. The amount of the net deferred income tax asset that is considered realizable could, however, be adjusted if estimates of future taxable income are adjusted. We apply a more likely than not threshold to the recognition and non-recognition of tax positions. A change in judgment related to prior years tax positions is recognized in the quarter of such change. Fair Value Measurements - The carrying amounts in the balance sheets for accounts receivable, mortgages and notes receivable, accounts payable and accrued expenses approximate fair value because of the immediate or short term maturity of these items. When stated interest rates are below market, we discounts mortgage notes receivable to reflect their estimated fair value. We carry our investments and securities available for sale at fair value. The carrying amounts reported for our long-term debt approximates fair value as our borrowings with commercial lenders are at interest rates that vary with market conditions and fixed rates that approximate market rates for comparable loans. Level 1- Valuations are based on unadjusted quoted prices in active markets for identical assets or liabilities. Level 2- Valuations are based on quoted prices for similar assets or liabilities in active markets, or quoted prices in markets that are not active for which significant inputs are observable, either directly or indirectly. significant to the overall fair value measurement. Inputs reflect managements best estimate of what market participants would use in valuing the asset or liability at the measurement date. The increase in operating revenue of $18.8 million or 23.6% for the year ended September 30, 2011 as compared with the year ended September 30, 2010, is primarily attributable to favorable pricing for our citrus, sugarcane and cattle operations and, to a lesser extent, the increase in sugarcane production due to the additional planting of approximately 4,000 acres and the increased citrus crop yield. Revenue from our citrus operations increased by $17.8 million year-over-year, due to favorable market pricing and an increase in our crop yield. Revenue from our sugarcane operations increased by $3.7 million for the year ended September 30, 2011 as compared to the year ended September 30, 2010. The decrease in operating revenue of $9.7 million or 10.9% for the year ended September 30, 2010 as compared with the year ended September 30, 2009, is primarily due to the decrease in the number of calves held and sold in feed lots and fewer acres of sugarcane in production year-over-year. Revenue from cattle operations decreased by $4.2 million or 50.8% due to the decrease in number of calves in feed lots as compared with fiscal 2009. Revenue from sugarcane decreased $3.5 million due to less sugarcane acres in production in 2010 as compared with 2009. Revenue from our vegetable operations decreased by $1.2 million or 26.1% due to certain adverse weather conditions experienced in 2010. We terminated our vegetable operations in June 2010. The decreases in operating revenue were partially offset by an increase in citrus sales of $1.3 million which was due to favorable market pricing. See Segment Results below for further discussion. Gross profit increased by $13.5 million or 136.1% for the year ended September 30, 2011 as compared with September 30, 2010, as a result of the favorable market pricing, an increase in production of our agricultural products, operating cost reductions and the discontinuation of our vegetable operations in June 2010. While the final prices received for our agricultural products are determined by the market, we believe that profit margins will improve as further cost savings are realized in our agricultural operations as more acres are used in production. operations to continue improving the gross profit of our segments. General and administrative expenses increased by $1.7 million or 26.9%, for the year ended September 30, 2011 as compared with September 30, 2010, primarily due to an increase in salaries of $1.0 million resulting from additions to the management team, and an increase in professional fees of $0.7 million. The remaining general and administrative expenses were comparable to fiscal year 2010 expenses. For the year ended September 30, 2010 as compared with the year ended September 30, 2009, general and administrative expenses decreased by $2.6 million or 29.0% due to the implementation of cost-reduction initiatives in 2009. The decrease was attributable to a reduction in salaries and employee benefit programs of $1.0 million and $1.6 million in certain other costs inclusive of all categories of general and administrative costs. Interest and investment income results primarily from interest bearing bank accounts and the investment in Magnolia. Interest and investment income decreased by $2.3 million or 249.6% for the year ended September 30, 2011, as compared with the same period in 2010. The decrease is primarily due to $1.7 million in allocated surplus from an agricultural cooperative recorded in other assets on our consolidated balance sheets which was fully reserved and a decrease in investment income from Magnolia totaling $0.5 million year-over-year. The allocated surplus was recorded based on the patronage allocation from our participation with Farm Credit of Florida (formerly known as Farm Credit of Southwest Florida) (Farm Credit). Because Farm Credit had made no distributions of the surplus during 2010 and subsequently announced in 2011 the indefinite suspension of any future distributions of members allocated surplus, we determined that the asset was uncollectible and future collections of the allocated surplus were indeterminable. See Note 4. Investments, Deposits and Other Assets in the Notes to Consolidated Financial Statements. In May 2010, we invested $12.2 million to obtain a 39% equity interest in Magnolia. The investment in Magnolia is accounted for in accordance with the equity method of accounting in which we record our 39% interest in the reported income or loss of the fund each quarter. For the year ended September 30, 2011, we recorded income of $68,000 as compared with income of $549,000 for year ended September 30, 2010. See Note 6. Investment in Magnolia Fund in the Notes to Consolidated Financial Statements. Interest and investment income increased by $0.3 million or 54.7% for the year ended September 30, 2010, as compared with the same period in fiscal 2009. The increase was primarily due to the investment in Magnolia, in which we recognized $0.5 million of interest and investment income for the year ended September 30, 2010, and the liquidation of auction rate securities resulting in investment income of $0.2 million. The increase was partially offset by decreases in interest income related to seller financed mortgages caused by interest rate fluctuations and a default on a mortgage note. In April 2009, a purchaser defaulted on a $52.0 million mortgage held by our subsidiary Alico-Agri. We also recorded impairments related to auction rate securities of $0.8 million during the year ended September 30, 2009. Interest expense decreased by $4.9 million or 70.6% for the year ended September 30, 2011, as compared with the year ended September 30, 2010. The decrease in interest expense is primarily due to non-recurring costs associated with refinancing our long-term debt of $3.4 million with Rabo AgriFinance, Inc. (Rabo) in September 2010, lower interest rates obtained through the refinancing of our credit facility, and the reduction of outstanding debt. Average interest rates for the year ended September 30, 2011, were 2.96% as compared with 5.29% for the year ended September 30, 2010. See Note 10. Long-Term Debt in the Notes to Consolidated Financial Statements. previously unamortized loan origination fees of $0.3 million and prepayment penalties of $3.1 million. Excluding the effects of the refinancing, interest expense declined during the year ended September 30, 2010 as compared with the year ended September 30, 2009, due to a decrease in outstanding debt. Outstanding debt was $73.5 million and $78.9 million at September 30, 2010, and 2009, respectively. In January 2009, we used the proceeds from our subsidiarys, Agri-Insurance Company, Ltd. (Agri-Insurance), pre-liquidation distributions to pay down our revolving line of credit. Due to the continued depressed real estate market in Southwest Florida, we did not have any real estate sales during the fiscal years ended September 30, 2011, and 2010. On September 30, 2010, we foreclosed on a 4,173 acre parcel located next to Florida Gulf Coast University in Lee County, Florida, which had been sold to Ginn-LA Naples, LTD. LLP (Ginn) in July 2005. We recognized a total of $3.0 million of real estate revenue for the fiscal year ended September 30, 2009, of which $1.6 million was classified as non-operating revenue for the period. Under the terms of the foreclosure and the contract, Alico-Agri released 399 acres of property to Ginn in recognition of prior principal payments. The net effect of the transaction was to cancel the mortgage note, reduce accrued commissions payable, surrender the tax certificates and reclassify the net balance of $6.6 million as basis in the property. This transaction did not have an impact on our financial position or cash flows. Due to the continued decrease in the real estate market prices in Southwest Florida, we evaluated several of our properties for impairment at September 30, 2011, 2010 and 2009. No impairments were recorded in fiscal year 2011. Impairments of $1.0 million and $5.9 million were recognized and charged to operations during the years ended September 30, 2010, and 2009, respectively. In conducting our evaluations, we reviewed the estimated non-discounted cash flows from each of the properties and obtained independent third party appraisals from a qualified real estate appraiser. Based on this information, we determined that a 291 acre lakefront property in Polk County, Florida had been impaired; we recorded $2.8 million at September 30, 2009 and an additional $1.0 million at September 30, 2010. The impairment charges were included in the real estate operating expenses during the respective years. Additionally, we determined that a parcel of land in Hendry County, Florida with a cost basis of $3.6 million was impaired by $1.5 million at September 30, 2009. Our remaining carrying value in this parcel was $2.0 million at September 30, 2010. We also recorded impairments to both our breeding herd and auction rate securities of $0.8 million during the fourth quarter of 2009. See Note 7. Property, Buildings and Equipment. Income tax expense (benefit) was $5.4 million, $(1.2) million and $0.2 million for the years ended September 30, 2011, 2010 and 2009, respectively. Our effective tax rate was 43.3%, 65.8% and (4.7)% for the year ended September 30, 2011, 2010 and 2009, respectively. Our effective tax rate increased in fiscal 2010 due to the adjustment of our valuation allowance for charitable contributions totaling $569,000, which resulted in a higher effective rate than the expected combined tax rate of 38%. The charitable contribution is from a $5.0 million pledge that was made to Florida Gulf Coast University in fiscal 2002. The donation was paid $1.0 million in fiscal 2002 and $0.8 million annually from fiscal 2003 through 2008. The donation is the primary source of the contribution carry forward. Based on income forecasts for subsequent years, the expected tax rate for fiscal 2009 was lowered for deferred items and we established an allowance account for charitable contribution carry forward at September 30, 2009. Additionally, we recognized income taxes for charitable contributions that expired during the year. The cumulative impact of these adjustments was to reduce the tax benefit for the year ended September 30, 2009 by $1.0 million and reduce the effective tax rate by 29.6%. In the fiscal years ended September 30, 2011 and 2010, the IRS issued five RARs pursuant to its examinations of Alico, Agri-Insurance and Alico-Agri for the tax years 2005 through 2007. These RARs principally challenge (i) Agri-Insurances ability to elect to be treated as a United States taxpayer during the years under examination; and (ii) Alico-Agris ability to recognize income from two real estate sales under the installment method by asserting that Alico-Agri was a dealer in real estate during the years under examination. Based on the positions taken in the RARs, the IRS claimed additional taxes and penalties due of $31.1 million consisting of $14.5 million in taxes and $16.6 million in penalties. The RARs did not quantify the interest on the taxes. We contested the positions taken in the RARs and pursued resolution through the IRS Appeals process. On November 22, 2011, we reached an agreement in principle with the IRS to settle all issues. The settlement provides that Agri-Insurance was eligible to elect to be treated as a United States taxpayer. No determination was made as to whether Alico or Alico-Agri was a dealer in real estate; however, for the two sales transactions at issue, we agreed to treat one-third of the taxable gain as ordinary income taxable in the year of sale with the remaining two-thirds treated as capital gain eligible for installment sale treatment. Federal and state taxes and interest due as a result of the settlement are estimated at approximately $0.9 million and $0.7 million, respectively, and have been accrued at September 30, 2011. However, the estimated effect on income tax expense for the year ended September 30, 2011, is only $0.6 million due to the reversal of temporary differences. The estimated taxes and interest Federal penalties of $15.3 million were considered by IRS Appeals and have been waived. The remaining $1.3 million in penalties have not yet been considered by IRS Appeals to date but waiver of these penalties would be consistent with the issues resolved in the settlement. The settlement does not preclude us from using the installment sale method with respect to future transactions. See Note 12. Income Taxes and Note 18. Subsequent Events in the Notes to Consolidated Financial Statements. Agricultural operating revenues increased by $18.7 million or 24.3% for the year ended September 30, 2011, as compared with the same period of 2010. The increase in agricultural revenues year-over-year is primarily due to favorable market pricing of citrus, sugarcane and cattle and to a lesser extent, the increase in sugarcane production due to the additional planting of approximately 4,000 acres. Total operating revenues increased by $18.8 million or 23.6% for the year ended September 30, 2011. 26.1% due to certain weather conditions experienced in 2010. We terminated our vegetable operations in June 2010. The decreases in revenue were partially offset by an increase in Bowen and citrus sales of $1.3 million which was due to favorable market pricing of our citrus products. Total operating revenue decreased by $9.7 million or 10.9% for the year ended September 30, 2010 as compared to the same period in 2009. We measure gross profit from operations before any allocation of corporate overhead or interest charges to the respective segments. Gross profit is dependent upon the prices received for each of our products, less harvesting, marketing and delivery costs and the direct costs of producing the products, including depreciation expense. Gross profit from agricultural operations for the year ended September 30, 2011, increased by $12.5 million or 124.3% as compared with the year ended September 30, 2010. Gross profit from total operations increased by $13.5 million or 136.1% year-over-year. The increase in gross profit is primarily due to favorable market prices received for our agricultural products, increases in citrus and cattle production and, to a lesser extent, the increase in crop yield from the additional 4,000 acres of sugarcane planted and the discontinuation of our unprofitable vegetable operations in June 2010. Gross profits from agricultural operations increased $6.1 million or 155.8% for year ended September 30, 2010, as compared with the fiscal year ended September 30, 2009. Gross profit from total operations increased $8.1 million or 439.9% year-over-year due to our cost-reduction initiatives which began in fiscal 2009. The increase in gross profit from total operations was primarily due to decreases in operating expenses primarily from cattle and sugarcane and, to a lesser extent, vegetables and citrus, in addition to favorable market pricing of our citrus products. During fiscal 2009 and 2010, we implemented cost-reduction initiatives and scaled back certain operations resulting in reductions in certain operating costs and improvements in our gross profit. Agricultural operations provided approximately 97.3% of total operating revenues for the year ended September 30, 2011, as compared with 96.7% for the year ended September 30, 2010. Agriculture revenues increased by $18.7 million or 24.3% for the year ended September 30, 2011, as compared with the year ended September 30, 2010, due to favorable market prices for citrus, sugarcane and cattle and the increase in production of citrus, sugarcane and cattle. and an increase in number of boxes purchased for the year ended September 30, 2011, revenues increased by $7.2 million or 25.0% year-over-year. The number of boxes purchased for the years ended September 30, 2011, and 2010, were 3.0 million and 2.8 million, respectively, an increase of 7.1% year-over-year. Gross profit increased by $0.3 million or 38.4% for the year ended September 30, 2011, as compared with the same period in 2010 due to the same factors as noted above. However, gross profit in fiscal 2011 was negatively impacted by increases in operating expenses resulting from higher fruit costs and harvesting costs. Bowens operations produced revenues of $28.9 million and $28.0 million, for the years ended September 30, 2010 and 2009, respectively, an increase of $0.9 million or 3.2%. Gross profits were $0.7 million and $1.3 million, for the years ended September 30, 2010, and 2009, respectively, a decrease of $0.6 million or 45.7%. Gross profits were negatively impacted by increases in citrus prices for purchased fruit during 2010, resulting from a freeze during January of 2010. The number of boxes purchased for the years ended September 30, 2010, and 2009, were 2.8 million for each. The Citrus Groves segment primarily produces citrus fruit for delivery to citrus processors in the State of Florida. Revenues increased in the Citrus Groves segment by $10.6 million or 29.1% for the year ended September 30, 2011, as compared with the same period in 2010. Gross profits increased by $8.6 million or 79.9% for the year ended September 30, 2011, as compared with the year ended September 30, 2010. The increase in revenue and gross profits year-over-year was due to an increase in citrus prices as a result of market supply conditions and increases in our crop yield resulting in lower costs on a per box basis. Citrus prices increased by 17.2% for the year ended September 30, 2011, as compared with the same period of 2010. The number of boxes harvested during the year ended September 30, 2011, was 4.1 million as compared with 3.6 million for the year ended September 30, 2010, an increase of 13.9% year-over-year. Revenues were $36.5 million and $36.0 million for the fiscal years ended September 30, 2010, and 2009, respectively, an increase of $0.5 million or 1.2% year-over-year and gross profits were $10.7 million and $8.7 million, respectively, an increase of $2.0 million or 23.0%, for the same periods. Citrus prices increased by 9% for the year ended September 30, 2010, as compared with the year ended September 30, 2009, resulting in an increase in revenue and gross profit although the number of boxes harvested decreased year-over by 7.7%. The number of boxes harvested was 3.6 million and 3.9 million for the years ended September 30, 2010, and 2009, respectively. The decrease in the number of boxes harvested resulted from less favorable growing conditions partially due to weather experienced in fiscal 2010. The decrease of $1.6 million in operating expenses for fiscal year 2010, as compared with fiscal year 2009 was primarily due to lower harvesting and marketing costs due to less boxes being harvested. We use contracts with citrus processors that include pricing structures based on a minimum (floor) price and with a price increase (rise) if market conditions exceed the floor price. Therefore, if pricing in the market is favorable we benefit from the incremental difference between the floor and the final market price. Sugarcane operations consist of cultivating sugarcane for sale to a sugar processor. Sugarcane revenue increased by $3.7 million or 90.3% for the year ended September 30, 2011, as compared with the same period in 2010. The gross profit for the year ended September 30, 2011, was $1.0 million as compared with $0.4 million for year ended September 30, 2010, an increase of $0.6 million or 146.7%. The increase in revenues and gross profit was attributable to favorable market prices received for sugarcane and the increase in sugarcane production from the additional 4,000 acres planted as a result of the replanting efforts which began in fiscal 2010. Sugarcane prices increased by 12% for the year ended September 30, 2011, as compared with same period of 2010. Net standard tons of sugarcane harvested were approximately 0.2 million and 0.1 million for the year ended September 30, 2011, and 2010, respectively, an increase of 73%. led us to begin a program in fiscal 2010 to replant our sugarcane fields in order to achieve prior production levels. As a result of this replanting, we have begun to realize an increase in crop yields during fiscal 2011. Sugarcane revenues were $4.1 million and $7.6 million for the fiscal years ended September 30, 2010, and 2009, respectively. Gross profit (losses) were $0.4 million and $(2.2) million for the years ended September 30, 2010 and 2009, respectively, an increase of $2.6 million or 117.8%. During the fiscal years 2010 and 2009, 0.1 million and 0.2 million standard tons of sugarcane were harvested, respectively, a decrease of 0.1 million or 50.0%. The decrease in standard tons was due to the decision to reduce sugarcane plantings. During fiscal 2009, we wrote down our sugarcane inventory related to the crop to be harvested during the 2009-2010 season by $1.3 million. The write down of sugarcane inventory was primarily due to a cold front which swept through Florida causing temperatures to drop into the mid twenties during the last week of January and first week of February 2009, resulting in damage to our sugarcane crop and low market prices projected for fiscal year 2010. Revenues from Cattle operations were $4.6 million and $4.0 million for the years ended September 30, 2011, and 2010, respectively, an increase of $0.6 million or 14.3%. Gross profit from our Cattle operations increased by $1.2 million or 445.6% year-over-year. The increase was due to favorable pricing of calves and the reductions in operating expenses of $0.6 million. The total pounds of beef sold were 3.9 million and 4.2 million and the average price received per pound sold was $1.16 and $0.95 for the year ended September 30, 2011, and 2010, respectively. Revenues from Cattle operations were $4.0 million and $8.2 million, a decrease of $4.2 million or 50.8% for the years ended September 30, 2010, and 2009, respectively. Gross profit (loss) from cattle operations were $0.3 million and $(2.0) million, an increase of $2.3 million or 113.4% for the years ended September 30, 2010, and 2009, respectively. The decrease in revenue year-over-year was due to the decreased number of calves, resulting in a reduction of the total pounds of beef sold, which was partially offset by an increase in the average price per pound sold. During the year ended September 30, 2010, calves were sold directly to third parties from the ranch, rather than retaining ownership through the feedlots. The total pounds of beef sold were 4.2 million and 9.3 million, a decrease of 5.1 million or 54.8% and the average price received per pound sold was $0.95 and $0.89, an increase of $0.06 or 6.7% for the years ended September 30, 2010, and 2009, respectively. The expense per pound decreased during the year ended September 30, 2010 when compared with same period of 2009, primarily as a result of staff reductions and reductions in nonessential maintenance activities. In an effort to minimize risk related to its feeding efforts, during the fiscal year ended September 30, 2009, we purchased corn used for cattle feed at the feedyards. Subsequent declines in the price of corn after the purchase resulted in substantial losses. During the fourth quarter of fiscal year ended September 30, 2009, we determined our breeding herd was impaired after independent experts and willing third party buyers valued the breeding herd. The impairment adjustment of $0.8 million was included in the cattle operating expenses for the year ended September 30, 2009. Based on industry data concerning beef cattle inventory levels and demand projections, Alico currently believes that the outlook for cattle profitability will continue to be positive for the foreseeable future. Revenues from the sale of vegetables were $3.5 million and $4.8 million for the years ended September 30, 2010, and 2009, respectively; however, due to certain unfavorable weather events, we incurred gross losses of $1.8 million and $1.9 million for the years ended September 30, 2010, and 2009, respectively. As a result of these losses, we terminated our vegetable operations during the third quarter of fiscal 2010 and redeployed the acreage and equipment to our other operating divisions as appropriate. The termination of vegetable farming and redeployment of assets resulted favorably on our results of operations and cash flows in fiscal year 2011. Other agricultural operations included sod production and the sale of native plants to local landscaping companies. The sale of sod and native plants are not significant to our financial position, results of operations and cash flows. We lease land to others on a tenant-at-will basis for grazing, farming, oil exploration and recreational uses. Revenues from land rentals were $2.4 million, $2.4 million and $2.7 million for the years ended September 30, 2011, 2010 and 2009, respectively, resulting in gross profits of $1.2 million, $1.3 million and $1.6 million. Gross profits decreased by 7.7% for the year ended September 30, 2011 as compared to the same period in 2010. We are currently pursuing additional leases for our farm land. We believe that our current cash position, revolving credit facility and the cash we expect to generate from operating activities will provide us with sufficient liquidity to satisfy our working capital and capital expenditure requirements for the foreseeable future. We have a $60.0 million revolving line of credit (RLOC). Of the $60.0 million credit facility, approximately $46.0 million was available for our general use at September 30, 2011. See Note 10. Long-Term Debt in the Notes to the Consolidated Financial Statements. As of September 30, 2011, we had cash and cash equivalents of $1.3 million, as compared with, $10.9 million as of September 30, 2010, a decrease of $9.6 million year-over-year. The decrease in cash and cash equivalents is primarily due to the pay down of our outstanding debt of $16.3 million during fiscal 2011. In fiscal year 2011, we transferred our operating bank accounts to Rabobank, N.A. (Rabobank), an affiliate of our primary lender, Rabo. We also entered into a cash management agreement with Rabobank designed to minimize the outstanding balance on our RLOC. Our various Rabobank bank accounts are swept daily into a concentration account. A balance of $250,000 must be maintained in the concentration account on a daily basis. Any balances in excess of $250,000 are automatically applied to pay down the line of credit. If the balance in the concentration account falls below the $250,000, minimum draws are made on the revolving line of credit to maintain this target balance. The cash management program minimizes cash balances and outstanding debt on the line of credit. In September 2010, we refinanced a term loan and RLOC with Rabo. Under the terms of the refinance, we settled our previous term loan and RLOC with Farm Credit. The refinancing provided for a 10 year $40.0 million term note bearing interest at one month LIBOR plus 250 basis points, payable quarterly. Quarterly principal payments of $0.5 million are due from October 2011 through July 2020 with a balloon payment equal to the remaining unpaid principal and interest due in October 2020. The refinancing also provided us with a $60.0 million RLOC with a 10 year term. The interest rate on the line of credit was initially established at monthly, LIBOR plus 250 basis points. Beginning on February 1, 2011 and each subsequent February 1 until 2020, the interest rate spread over LIBOR is adjusted pursuant to a pricing grid based on our debt service coverage ratio for the immediately preceding fiscal year. The spreads may range from 225 to 275 basis points over monthly LIBOR. On October 1, 2015, the lender may adjust the interest rate spread to any percentage. Rabo must provide a 30 day notice of the new spreads, and we have the right to prepay the outstanding balance without penalty. Closing costs of $1.2 million related to the refinance were paid in September 2010, consisting of document stamps, loan origination fees, and legal and appraisal fees. The closing costs fees were capitalized and are being amortized over the term of the loans. The IRS examined our tax returns for the 2005 through 2007 tax years. The IRS principally challenged (i) Agri-Insurances ability to elect to be treated as a United States taxpayer during the years under examination; and (ii) Alico-Agris ability to recognize income from two real estate sales under the installment method by asserting that Alico-Agri was a dealer in real estate during the years under examination. The IRS claimed additional taxes and penalties due of $31.1 million consisting of $14.5 million in taxes and $16.6 million in penalties but did not quantify the interest on the taxes. We contested the positions taken by the IRS and pursued resolution through the IRS Appeals process. On November 22, 2011, we reached an agreement in principle to settle the issues. The settlement provides that Agri-Insurance was eligible to elect to be treated as a United States taxpayer. No determination was made as to whether Alico or Alico-Agri was a dealer in real estate; however, for the two sales transactions at issue, we agreed to treat one-third of the taxable gain as ordinary income taxable in the year of sale with the remaining two-thirds treated as capital gain eligible for installment sale treatment. Federal and state taxes and interest due as a result of the settlement are estimated at approximately $0.9 million and $0.7 million, respectively, and have been accrued at September 30, 2011. Federal penalties of $15.3 million were considered by IRS Appeals and have been waived. The remaining $1.3 million in penalties have not yet been considered by IRS Appeals to date but waiver of these penalties would be consistent with the issues resolved in the settlement. The settlement does not preclude us from using the installment sale method with respect to future transactions. See Note 12. Income Taxes and Note 18. Subsequent Events in the Notes to Consolidated Financial Statements. Net cash flows provided by operating activities were $16.7 million for the year ended September 30, 2011 which compared favorably to cash provided by operating activities of $7.1 million for year ended September 30, 2010. The change in cash provided by operating activities was due to changes in our working capital accounts: (i) an increase in inventories of $3.8 million due to additional sugarcane acres and, to a lesser extent, additional citrus acres being planted for the 2010-2011 crop year; (ii) a decrease in accounts receivable of $1.2 million due the timing of collections in 2011; (iii) an increase in accounts payable and accrued expenses of $1.8 million due to costs related to the additional plantings of sugarcane and citrus; and (iv) an increase in net income of $7.7 million year-over-year. During fiscal year 2010, we impaired one parcel of real estate in Polk County, Florida totaling $1.0 million; however, during fiscal year 2009 we recorded several non-cash adjustments to net loss for certain impairments. The impairments related to our breeding herd, two parcels of real estate and auction rate securities totaled approximately $5.9 million during the fiscal year ended September 30, 2009. Additionally, during fiscal year ended September 30, 2009, we adjusted our deferred tax rate and created an allowance account for our charitable contribution carry forward which resulted in net income decreasing by approximately $0.8 million. During fiscal year 2010, we received an income tax refund of $4.8 million from a net operating loss carryback which resulted from a prior IRS examination settlement. A settlement agreement with a vendor resulted in a $7.0 million collection in March 2009. Under the terms of the agreement, the vendor admitted no wrongdoing and stipulated that we not divulge the vendors name or the agreements circumstances. The payment was recognized in other income during fiscal year 2009.
of vested future benefits. Payments of $1.4 million were made to participants who elected the option in January 2009. Life insurance policies were liquidated to fund the payments. During fiscal year 2009, our subsidiary, Alico-Agri, received payment of $2.5 million in escrow for the restructure of a real estate contract (East) with Ginn; however, in April 2009, Ginn defaulted on the East contract. Under the terms of the contract, a quarterly interest payment of $0.3 million was due on March 30, 2009, but the payment was not received. Alico-Agri foreclosed on the property in September 2010. Cash used in investing activities for the years ended September 30, 2011 and 2010 was $8.1 million and $6.7 million, respectively. The increase in cash used in investing activities year-over-year is primarily due to capital expenditures in fiscal 2011 of $12.3 million, which included the purchase of our new office building on March 8, 2011, and related improvements totaling $2.9 million. Other capital expenditures during fiscal year 2011 included $4.3 million for sugarcane expansion, $1.6 million for citrus plantings, $1.2 million for cattle and $2.3 million for certain other capital expenditures. During fiscal year 2010 capital expenditures were $8.2 million which included $3.4 million for the development of an additional 4,000 acres of sugarcane plantings. We anticipate our capital expenditures, which include sugarcane plantings, citrus trees replantings, real estate entitlement work and purchasing cattle for breeding purposes to be approximately $9.5 million for fiscal year 2012. In fiscal year 2011 we received approximately $2.5 million as a return on our investment in Magnolia which we purchased a 39% equity interest for $12.2 million during fiscal year 2010. Also during fiscal year 2010 we received proceeds from the sale of certain other investments totaling $6.7 million and also received proceeds from the surrender of insurance policies of $5.7 million. See Note 6. Investment in Magnolia Fund in the Notes to the Consolidated Financial Statements. We restructured the funding program for the Benefit Plan in September 2010. As a result of the restructuring, we surrendered certain life insurance policies and received $5.7 million in cash surrender value payments. The Plan does not require Alico to specify a funding source for the Benefit Plan obligations. The remaining life insurance policies or the proceeds from these policies are not required to pay the Benefit Plan obligations. Cash (used in) provided by investing activities for year ended September 30, 2010 and 2009 was $(6.7) million and $13.8 million, respectively. The decrease in cash from investing activities year-over-year was primarily due to the $12.2 million investment in Magnolia during fiscal year 2010. During fiscal year 2009, Agri-Insurance Company, Ltd. (Agri-Insurance), our wholly owned subsidiary of Alico, was in the process of winding-down its operations. Agri-Insurance had been required to comply with certain liquidity provisions mandated by the Bermuda Monetary Authority. The sale of marketable securities, which had been held to comply with the liquidity provisions of the Bermuda Monetary Authority during fiscal year 2009, provided net investment proceeds of $18.1 million. Cash used for expenditures for land, equipment, buildings and other improvements totaled $8.2 million for fiscal year 2010 and $6.7 million for fiscal year 2009, an increase of $1.5 million. Cash used in financing activities was $18.2 million, $8.3 million and $65.8 million for the years ended September 30, 2011, 2010 and 2009, respectively. The cash used in financing activities during 2011 was from net repayments on borrowings of $16.3 million as compared to net repayments on borrowings of $5.5 million during the year ended September 30, 2010. The change in financing activities for fiscal year 2010 as compared with fiscal year 2009 was primarily due to the pre-liquidation proceeds received from the distribution of cash and investments held by Agri-Insurance which was used to pay $53.4 million on the Farm Credit RLOC in January 2009 and $5.4 million on the Farm Credit term loan. In September 2010, we refinanced our term loan and revolving line of credit. As a result of the refinancing, approximately $3.4 million of additional interest expense was recognized during the fourth quarter of 2010, consisting of previously unamortized loan origination fees of $0.3 million and prepayment penalties of $3.1 million. Loan origination fees of $1.2 million were paid to Rabo as a result of the refinancing, and are being amortized over the 10 year term of the agreement. On February 20, 2009, our Board of Directors authorized and our shareholders approved the repurchase of up to 350,000 shares of our common stock through November 1, 2013. In accordance with the 2008 Plan the Board of Directors may grant common stock to certain members of the board for their service and restricted stock grants to executives. Alico may purchase an additional 272,754 shares in accordance with the 2008 Plan. We purchased 48,280 shares in the open market at an average price of $24.96, 23,466 shares in the open market at an average price of $26.74 per share and 25,500 shares at an average price of $27.21 per share during the years ended September 30, 2011, 2010 and 2009, respectively. The cost of the treasury shares purchased was $1.2 million, $0.6 million and $0.9 million for the years ended September 30, 2011, 2010 and 2009, respectively. See Item 5 Issuer Repurchase of Equity Securities and Note 11. Treasury Shares in the Notes to the Consolidated Financial Statements. We declared dividends of $ 0.12 per share, $0.10 per share and $0.69 per share during the years ended September 30, 2011, 2010 and 2009, respectively. The cash payment of dividends was $0.7 million, $1.0 million and $6.1 million for the years ended September 30, 2011, 2010, and 2009, respectively. We have various contractual obligations which are recorded as liabilities in our consolidated financial statements. The following table presents our significant contractual obligations and commercial commitments on an undiscounted basis at September 30, 2011 and the future periods in which such obligations are expected to be settled in cash. (1) Interest is estimated on our long-term debt at the following rates: 2.76% for the Rabo term loan and revolving line of credit and 6.68% for the Farm Credit Mortgage. See Note 10. Long Term Debt in the Notes to Consolidated Financial Statements. (2) Includes years 4 and 5 only. Alico, through its wholly owned subsidiary Bowen, enters into contracts for the purchase of citrus fruit during the normal course of its business. The obligations under these purchase agreements totaled $18.2 million at September 30, 2011 for delivery in fiscal years 2012 and 2013. Bowens management currently believes that all committed purchase quantities can be sold at a profit. In June 2011, the Financial Accounting Standards Board (FASB) issued Accounting Standards Update (ASU) No. 2011-05, Comprehensive Income (Topic 220): Presentation of Comprehensive Income. The ASU amends the FASB Accounting Standards Codification (ASC) to allow an entity the option to present the total of comprehensive income, the components of net income and the components of other comprehensive income either in a single continuous statement of comprehensive income or in two separate but consecutive statements. The ASU eliminates the option to present the components of other comprehensive income as part of the statement of changes in stockholders equity. The amendments to the ASC do not change the items that must be reported in other comprehensive income or when an item of other comprehensive income must be reclassified to net income. ASU 2011-05 should be applied retrospectively. ASU 2011-05 is effective for fiscal years, and interim periods within those years, beginning after December 15, 2011. The adoption of ASU 2011-05 will not have a material impact on our financial position or results of operations as it only affects financial statement presentation. On May 12, 2011, the FASB issued ASU No. 2011-04, Fair Value Measurement (Topic 820): Amendments to Achieve Common Fair Value Measurement and Disclosure Requirements in U.S. GAAP and IFRSs (ASU 2011-04), which provides guidance on how (not when) to measure fair value and on what disclosures to provide about fair value measurements. ASU 2011-04 expands previously existing disclosure requirements for fair value measurements, including disclosures regarding transfers between Level 1 and Level 2 in the fair value hierarchy currently disclosed. ASU 2011-04 is effective for interim and annual periods beginning after December 15, 2011. We are currently assessing the impact, if any, on our consolidated financial statements. We do not believe that any other recently issued but not effective accounting standards, if currently adopted, will have a material effect on our financial position, result of operations or cash flows. The principal market risk (i.e., the risk of loss arising from adverse changes in market rates and prices) to which we are exposed is interest rates. The objective of our asset management activities is to provide an adequate level of liquidity to fund operations and capital expansion, while minimizing market risk. We do not actively invest or trade in equity securities. We do not believe that our interest rate risk related to cash equivalents and short-term investments is material due to the nature of the investments. Our results of operations and cash flows are subject to fluctuations due to changes in interest rates primarily from our variable interest rate long-term debt. Under our current positions, we do not use interest rate derivative instruments to manage exposure to interest rate changes. A change in our interest rate of 100 basis points on our long-term debt would have resulted in additional interest expense of approximately $0.6 million and a decrease in our net income of $0.4 million for the year ended September 30, 2011. Consolidated Financial Statements of Alico, Inc.
All schedules are omitted for the reason that they are not applicable or the required information is included in the financial statements or notes. We have audited the accompanying consolidated balance sheets of Alico, Inc. and Subsidiaries as of September 30, 2011 and 2010, and the related consolidated statements of operations, stockholders equity and comprehensive income (loss), and cash flows for each of the three years in the period ended September 30, 2011. These financial statements are the responsibility of the Companys management. Our responsibility is to express an opinion on these financial statements based on our audits. In our opinion, the consolidated financial statements referred to above present fairly, in all material respects, the financial position of Alico, Inc. and Subsidiaries as of September 30, 2011 and 2010, and the results of their operations and their cash flows for each of the three years in the period ended September 30, 2011, in conformity with U.S. generally accepted accounting principles. We have also audited, in accordance with the standards of the Public Company Accounting Oversight Board (United States), Alico, Inc. and Subsidiaries internal control over financial reporting as of September 30, 2011, based on criteria established in Internal Control  Integrated Framework issued by the Committee of Sponsoring Organizations of the Treadway Commission, and our report dated December 14, 2011, expressed an unqualified opinion on the effectiveness of Alico, Inc. and Subsidiaries internal control over financial reporting. We have audited Alico, Inc. and Subsidiaries internal control over financial reporting as of September 30, 2011, based on criteria established in Internal Control  Integrated Framework issued by the Committee of Sponsoring Organizations of the Treadway Commission. Alico, Inc. and Subsidiaries management is responsible for maintaining effective internal control over financial reporting and for its assessment of the effectiveness of internal control over financial reporting included in the accompanying Managements Report on Internal Control Over Financial Reporting. Our responsibility is to express an opinion on the companys internal control over financial reporting based on our audit. A companys internal control over financial reporting is a process designed to provide reasonable assurance regarding the reliability of financial reporting and the preparation of financial statements for external purposes in accordance with generally accepted accounting principles. A companys internal control over financial reporting includes those policies and procedures that (a) pertain to the maintenance of records that, in reasonable detail, accurately and fairly reflect the transactions and dispositions of the assets of the company; (b) provide reasonable assurance that transactions are recorded as necessary to permit preparation of financial statements in accordance with generally accepted accounting principles, and that receipts and expenditures of the company are being made only in accordance with authorizations of management and directors of the company; and (c) provide reasonable assurance regarding prevention or timely detection of unauthorized acquisition, use, or disposition of the companys assets that could have a material effect on the financial statements. In our opinion, Alico, Inc. and Subsidiaries maintained, in all material respects, effective internal control over financial reporting as of September 30, 2011, based on criteria established in Internal Control  Integrated Framework issued by the Committee of Sponsoring Organizations of the Treadway Commission. We have also audited, in accordance with the standards of the Public Company Accounting Oversight Board (United States), the consolidated balance sheets of Alico, Inc. and Subsidiaries as of September 30, 2011 and 2010, and the related consolidated statements of operations, stockholders equity and comprehensive income (loss), and cash flows for each of the three years in the period ended September 30, 2011, and our report dated December 14, 2011 expressed an unqualified opinion. Preferred stock, no par value. Authorized 1,000,000 shares; issued and outstanding, none. Alico Inc. (Alico) and its wholly owned subsidiaries, (together with Alico, collectively, the Company) is a land management company primarily engaged in a variety of agribusiness pursuits in addition to land leasing, rock and sand mining and real estate operating in Central and Southwest Florida. The consolidated financial statements include the accounts of Alico, Inc., and its wholly owned subsidiaries, (the Company), Alico Land Development, Inc. (ALDI), Agri-Insurance Company, Ltd. (Agri-Insurance), Alico-Agri, Ltd., Alico Plant World, LLC and Bowen Brothers Fruit, LLC (Bowen). Agri-Insurance was liquidated in September 2010. All significant intercompany accounts and transactions have been eliminated in consolidation. Certain reclassifications have been made to the prior years consolidated financial statements to conform to the 2011 presentation. These reclassifications had no impact on working capital, net income, stockholders equity or cash flows as previously reported. The preparation of financial statements in conformity with accounting principles generally accepted in the United States (GAAP) requires management to make estimates and assumptions that affect the reported amounts of assets, liabilities, revenues and expenses and disclosure of contingent assets and liabilities at the date of the financial statements, and the reported amounts of revenues and expenses during the reporting period. Actual results could differ from those estimates based upon future events. The Company periodically evaluates the estimates. The estimates are based on current and expected economic conditions, historical experience and various other specific assumptions that the Company believes to be reasonable. Revenue from agricultural crops is recognized at the time the crop is harvested and delivered to the customer. Management reviews the reasonableness of the revenue accruals quarterly based on buyers and processors advances to growers, cash and futures markets and experience in the industry. Adjustments are made throughout the year to these estimates as more current relevant information regarding the specific markets become available. Differences between the estimates and the final realization of revenue can be significant and can be either positive or negative. During the periods presented in this report, no material adjustments were noted to the reported revenues of Alicos crops. Cash includes cash on hand, bank demand accounts and money market accounts having original maturities at acquisition date of 90 days or less. At various times throughout the year and at September 30, 2011, some deposits held at financial institutions were in excess of federally insured limits. The Company has not experienced any losses related to these balances, and believes credit risk to be minimal. Accounts receivable are generated from the sale of citrus, sugarcane, cattle, leasing and other transactions. The Company provides an allowance for doubtful trade receivables equal to the estimated uncollectible amounts. That estimate is based on historical collection experience, current economic and market conditions, and a review of the current status of each customers account. The carrying amounts of the Companys financial instruments, including cash and cash equivalents, certificates of deposit, accounts receivable, mortgages and notes receivable, accounts payable and accrued expenses approximate their fair value because of the immediate or short term nature of these assets and liabilities. Where stated interest rates are below market, Alico has discounted mortgage notes receivable to reflect their estimated fair value. The carrying amounts of long-term debt approximates fair value because the transactions are with commercial lenders at interest rates that vary with market conditions and fixed rates that approximate market rates for similar obligations. See Note 3, Fair Value Measurements. For the fiscal year ended September 30, 2011, our largest customer, United States Sugar Corporation, (USSC) and its wholly owned subsidiary Southern Gardens, accounted for 28% of operating revenue. Since the inception of its sugarcane program in 1988, the Company has sold 100% of its product to USSC, a local Florida sugar mill. Additionally, Alico sells citrus products to Southern Gardens. While the Company believes that it can replace the citrus processing portion of the contracts with other customers, it may not be able to do so quickly and the results may not be as favorable as the current contracts. Due to the location of the Companys sugarcane fields relative to the location of alternative processing plants, the loss of USSC as a customer would have an adverse material impact on the Companys sugarcane operations. In recognizing revenue from land sales, Alico applies specific sales recognition criteria to determine when land sales revenue can be recorded. For example, in order to fully recognize gain resulting from a real estate transaction, the sale must be consummated with a sufficient down payment of at least 20% to 25% of the sales price depending upon the type and timeframe for development of the property sold, and any receivable from the sale cannot be subject to future subordination. In addition, the seller cannot retain any material continuing involvement in the property sold. When these criteria are not met the Company recognizes gain proportionate to collections utilizing either the installment method or deposit method as appropriate. Investments are carried at their fair value. Net unrealized investment gains and losses that are considered to be temporary are recorded net of related deferred taxes in accumulated other comprehensive income in stockholders equity until realized. Unrealized losses determined to be other than temporary are recognized in the statement of operations in the period the determination is made. The cost of all investments is determined on the specific identification method. See Note 6. Investment in Magnolia. The costs of growing crops are capitalized into inventory until the time of harvest. Such costs are expensed when the crops are harvested and are recorded in agricultural operations operating expenses in the Statement of Operations. Inventories are stated at the lower of cost or net realizable value. The cost for unharvested citrus and sugarcane crops is based on accumulated production costs incurred during the period from January 1 through the balance sheet date. The cost of the beef cattle inventory is based on the accumulated cost of developing such animals for sale. Mortgages and notes receivable arise from real estate sales. Mortgages and notes receivable are carried at their estimated net realizable value. In circumstances where the stated interest rate is below the prevailing market rate, the note is discounted to yield the market rate of interest. The discount offsets the carrying amount of the mortgages and notes receivable. Under the installment method of accounting, gains from commercial or bulk land sales are not recognized until payments received for property equal or exceed 20% of the contract sales price for property to be developed within two years after the sale or 25% of the contract sales price for property to be developed after two years. Such gains are recorded as deferred revenue and offset the carrying amount of the mortgages and notes receivable. Property, buildings and equipment are stated at cost, net of accumulated depreciation or amortization. Major improvements are capitalized while maintenance and repairs are expensed in the period the cost is incurred. Costs related to the development of citrus groves through planting of trees are capitalized. Such costs include land clearing, excavation and construction of ditches, dikes, roads, and reservoirs, among other costs. After the planting, caretaking costs or pre-productive maintenance costs are capitalized for four years. After four years, a grove is considered to have reached maturity and the accumulated costs, except for land excavation, are depreciated over 25 years. Costs related to the development of sugarcane are capitalized in a similar manner as citrus groves. However, sugarcane matures in one year and typically the Company will harvest an average of three crops (one per year) from one planting. As a result, cultivation and caretaking costs are expensed as the crop is harvested, while the development and planting costs are depreciated over three years. The breeding herd consists of purchased animals and animals raised on the Companys ranch. Purchased animals are stated at the cost of acquisition. The cost of animals raised on the ranch is based on the accumulated cost of developing such animals for productive use. Depreciation is computed using the straight-line method over the estimated useful lives of the various classes of depreciable assets. The Company reviews its long-lived assets for impairment whenever events or changes in circumstances indicate that the carrying amount of an asset may not be recoverable. The Company records impairment losses on long-lived assets used in operations, other than goodwill, when events and circumstances indicate that the assets might be impaired and the estimated cash flows (discounted and without interest charges) to be generated by those assets over the remaining lives of the assets are less than the carrying amount of those items. Our cash flow estimates are based on historical results adjusted to reflect our best estimates of future market conditions and operating conditions. The net carrying value of assets not recoverable is reduced to fair value. See Note 7. Property, Building and Equipment for further discussion. Investments, deposits and other non-current assets primarily include stock owned in agricultural cooperatives and loan origination fees. Investments in stock related to agricultural co-ops and deposits are carried at cost. The Company uses a cooperative to harvest sugarcane. The cooperatives require members to acquire stock ownership as a condition for the use of its services. The Company follows the asset and liability method of accounting for deferred taxes. The provision for income taxes includes income taxes currently payable and those deferred as a result of temporary differences between the financial statements and tax bases of assets and liabilities. Deferred tax assets and liabilities are measured using enacted tax rates expected to apply to taxable income in the years in which those temporary differences are expected to be recovered or settled. The effect of a change in tax rates on deferred tax assets and liabilities is recognized in income or loss in the period that includes the enactment date. A valuation allowance is provided to reduce deferred tax assets to the amount of future tax benefit when it is more likely than not that some portion of the deferred tax assets will not be realized. Projected future taxable income and ongoing tax planning strategies are considered and evaluated when assessing the need for a valuation allowance. Any increase or decrease in a valuation allowance could have a material adverse or beneficial impact on the Companys income tax provision and net income or loss in the period the determination is made. The Company recognizes interest and/or penalties related to income tax matters in income tax expense. Basic earnings (loss) per share is calculated by dividing net income (loss) by the weighted average number of common shares outstanding for the period. Diluted earnings (loss) per share is calculated by dividing net income (loss) by the weighted average number of common shares outstanding for the period, including all potentially dilutive shares issuable under outstanding stock options and restricted stock unless the effect is anti-dilutive. There were no stock options outstanding at September 30, 2011, 2010 and 2009. The non-vested restricted shares entitle the holder to receive non-forfeitable dividends upon issuance and are included in the calculation of basic earnings per share. Comprehensive income is defined as the change in equity of a business enterprise during a period from transactions and other events and circumstances from non-owner sources. It includes both net income or loss and other comprehensive income or loss. Items included in other comprehensive income or losses are classified based on their nature. The total of other comprehensive income or loss for a period has been transferred to an equity account and displayed as accumulated other comprehensive income in the accompanying Consolidated Balance Sheets. Stock-based compensation cost is measured at the grant date based on the fair value of the award and is typically recognized as expense on a straight-line basis over the vesting period. Upon the vesting of restricted stock, the Company issues common stock from shares held in treasury. Effective November 1, 2008, the Company adopted the 2008 Alico, Inc. Incentive Equity Plan (the 2008 Plan) approved by the shareholders on February 20, 2009. In accordance with the 2008 Plan, the Board of Directors may grant stock options, stock appreciation rights, and/or restricted stock to certain directors and employees of the Company. The 2008 Plan authorized the purchase of 350,000 shares of previously issued shares of the Companys common stock. The 2008 Plan replaced the 1998 Plan which expired in November of 2008. Alico measures the cost of employee services on the grant-date fair value of the award. The cost is recognized over the period during which an employee is required to provide service in exchange for the award (usually the vesting period). The grant date fair value of employee share options and similar instruments are estimated using option-pricing models adjusted for the unique characteristics of those instruments (unless observable market prices for the same or similar instruments are available). The Company maintains a stock incentive plan whereby awards may be granted to executives in various forms including restricted shares of Companys common stock. Awards are discretionary and are determined by the Compensation Committee of the Board of Directors. Awards vest based upon service conditions. Non-vested restricted shares generally vest over requisite service periods of one to six years from the date of grant. The Company is recognizing compensation cost equal to the fair value of the stock at the grant dates prorated over the vesting period of each award. The fair value of the unvested restricted stock awards at September 30, 2011, was $148 thousand and will be recognized over the remaining service period. No stock options were granted in fiscal 2011, 2010 or 2009. The Company evaluates investments in which it does not hold an equity interest of at least 50% based on the amount of control it exercises over the operations of the investee, exposure to losses in excess of its investment, the ability to significantly influence the investee and whether Alico is the primary beneficiary of the investee. Investments held not meeting the above criteria are accounted for under the equity method whereby the ongoing investment in the entity, consisting of its initial investment adjusted for distributions, gains and losses of the entity are classified as a single line in the balance sheet and as a non-operating item in the income statement. The Company accounts for its investment in Magnolia, TC2, LLC, (Magnolia) under the equity method. See Note 6. Investment in Magnolia for further discussion. of other comprehensive income must be reclassified to net income. ASU 2011-05 should be applied retrospectively. ASU 2011-05 is effective for fiscal years and interim periods within those years, beginning December 15, 2011. The adoption of ASU 2011-05 will not have a material impact on the Companys financial position, results of operations and cash flows as it only affects financial statement presentation. On May 12, 2011, the FASB issued ASU No. 2011-04, Fair Value Measurement (Topic 820): Amendments to Achieve Common Fair Value Measurement and Disclosure Requirements in U.S. GAAP and IFRSs (ASU 2011-04), which provides guidance on how (not when) to measure fair value and on what disclosures to provide about fair value measurements. ASU 2011-04 expands previously existing disclosure requirements for fair value measurements, including disclosures regarding transfers between Level 1 and Level 2 in the fair value hierarchy currently disclosed. ASU 2011-04 is effective for the interim and annual periods beginning after December 15, 2011. The Company is currently assessing the impact, if any, on its consolidated financial statements. The Company does not believe that any other recently issued but not effective accounting standards, if currently adopted, will have a material effect on its financial position, result of operations or cash flows. The Company follows the provisions of ASC 820 Fair Value Measurements and Disclosure Topic for its financial and non-financial assets and liabilities. ASC 820, among other things, defines fair value, establishes a framework for measuring fair value and expands disclosure for each major asset and liability category measured at fair value on either a recurring or nonrecurring basis. The majority of the carrying amounts of the Companys assets and liabilities including cash, accounts receivable, accounts payable and accrued expenses at September 30, 2011 and 2010, approximate fair value because of the immediate or short term maturity of these items. Our certificates of deposit are valued by discounting the related cash flows based on current yields of similar instruments with comparable durations considering the credit-worthiness of the issuer. Certificates of deposit are valued using Level 1 inputs. In the event that stated interest rates are below market, Alico discounts mortgage notes receivable to reflect their estimated fair value. The carrying amounts reported for long-term debt approximates fair value as the Companys borrowings with commercial lenders are at interest rates that vary with market conditions and fixed rates that approximate market rates for comparable loans. There were no gains or losses included in earnings attributable to changes in non-realized gains or losses relating to assets held at 2011 and 2010. In fiscal year 2009, we recorded unrealized holding gains of $2 thousand as other comprehensive income in consolidated statement of stockholders equity and comprehensive income. Alico uses third party service providers to evaluate its investments. For investment valuations, current market interest rates, quality estimates by rating agencies and valuation estimates by active market participants were used to determine values. Deferred retirement benefits were valued based on actuarial data, contracted payment schedules and an estimated discount rate of 4.5% and 4.8% at September 30, 2011 and 2010, respectively. The Company evaluated its properties for impairment using Level 3 inputs during the year ended September 30, 2010, which resulted in an impairment charge of $980 thousand to a Polk County property; the remaining carrying value of the property was $2.0 million. See Note 7. Property, Buildings and Equipment. (a) During the second quarter of 2011, the Company fully reserved $1.7 million in cooperative allocated surplus it had recorded based on its patronage allocation with Farm Credit. As an agricultural credit cooperative, Farm Credit is owned by the member-borrowers who purchase stock and earn participation certificates which represent each members-borrowers respective share of the allocated surplus in the cooperative. Allocations of the surplus are made to members on an annual basis according to the proportionate amount of interest paid by each member. Allocations are made in cash and non-cash participation certificates. Farm Credit did not make any distributions of allocated surplus during 2010 and subsequently announced in 2011 the indefinite suspension of any future distributions of members allocated surplus; therefore, the Company determined that the entire amount was uncollectible as no future revolvement plan has been established. The full reserve of the $1.7 million is included in interest and investment income, net, in the accompanying consolidated statements of operations. inventory resulted from changing market conditions for the respective crops and cattle and were recognized as operating expenses. In May 2010, Alico invested $12.2 million to obtain a 39% limited partner equity interest in Magnolia TC 2, LLC (Magnolia) a Florida limited liability company whose primary business activity is acquiring tax certificates issued by various counties in the State of Florida on properties which have property tax delinquencies. In Florida, such certificates are sold at general auction based on a bid interest rate. If the property owner does not redeem such certificate within two years, which requires the payment of delinquent taxes plus the bid interest, a tax deed can be obtained by the winning bidder who can then force an auctioned sale of the property. Tax certificates hold a first priority lien position. Revenue is recognized by Magnolia when the interest obligation under the tax certificates it holds becomes a fixed amount. In order to redeem a tax certificate in Florida, a minimum of 5% of the face amount of the certificate (delinquent taxes) must be paid to the certificate holder regardless of the amount of time the certificate has been outstanding. Magnolia recognized the minimum 5% earnings on its tax certificate portfolio in fiscal 2010. Expenses of Magnolia include an acquisition fee of 1%, interest expense, a monthly management fee and other administrative costs. The investment in Magnolia is accounted for in accordance with the equity method of accounting, whereby the Company records its 39% interest in the reported income or loss of the fund each quarter. Based on the September 30, 2011, unaudited internal financial statements of Magnolia, Alico recorded net investment income of $68 thousand for the year ended September 30, 2011, as compared with investment income of $549 thousand for the year ended September 30, 2010. Magnolia made certain distributions during the year ended September 30, 2011; the Companys share of those distributions was approximately $ 2.5 million. Depreciation expense for property, buildings and equipment was $7.3 million, $7.2 million and $7.5 million for the year ended September 30, 2011, 2010 and 2009, respectively. Due to the continuing depressed market prices of real estate in Florida, the Company evaluated several of its properties for impairment at September 30, 2011, 2010 and 2009. In conducting its evaluation, the Company reviewed the estimated non-discounted cash flows from each of the properties or obtained independent third party appraisals from a qualified real estate appraiser. Impairment charges of $1.0 million and $4.3 million were recorded in 2010 and 2009, respectively. During fiscal 2009, due to the losses in the cattle division and increasing costs to raise cattle for breeding purposes, the Company evaluated its breeding herd for impairment using market observations and quotes for similar herds based on ages, condition and pregnancies. The Company recorded $813 thousand in impairment charges for its breeding herd in 2009. No impairment charges were recorded for the breeding herd during 2011 or 2010. 2010. Pursuant to the foreclosure, the net balance of the mortgage note, deferred revenue, accrued interest, tax certificates and the associated accrued commission payable totaling $6.6 million were reclassified as basis in the property. (1) Includes additions, sales and deaths of the breeding herd from September 30, 2009 through September 30, 2011. The Company has a revolving line of credit and term loan with Rabo AgriFinance, Inc. (Rabo) totaling $100.0 million and a mortgage of approximately $3.2 million with Farm Credit. The revolving line of credit is collateralized by 44,277 acres of farmland, and the term note is collateralized by 12,280 acres of property containing approximately 8,600 acres of producing citrus groves. The mortgage is collateralized by 7,680 acres of real estate in Hendry County used for farm leases, sugarcane and citrus production. The term loan requires quarterly payments of interest at a floating rate of one month LIBOR plus 250 basis points beginning October 1, 2010. Quarterly principal payments of $0.5 million, together with accrued interest, began on October 1, 2011 and continue until October 1, 2020, when the remaining principal balance and accrued interest will be due and payable. The Rabo credit facility also provides a ten year $60.0 million revolving line of credit which bears interest at a floating rate equal to one month LIBOR plus 250 basis points on the outstanding balance payable quarterly beginning October 1, 2010. Thereafter, quarterly interest will be payable on the first day of January, April, July and October until the revolving line of credit matures on October 1, 2020 and the remaining principal balance and accrued interest shall be due and payable. Proceeds from the revolving line of credit may be used for general corporate purposes including: (i) the normal operating needs of Alico and its operating divisions, (ii) the purchase of capital assets; and (iii) the payment of dividends. The interest rate on the revolving line of credit was initially established at one month LIBOR plus 250 basis points. Beginning on February 1, 2011 and each subsequent February 1 through 2020, the interest rate spread over LIBOR is adjusted pursuant to a pricing grid based on our debt service coverage ratio for the immediately preceding fiscal year. The spreads may range from 225 to 275 basis points over one month LIBOR. The rate was not adjusted at February 1, 2011, and remains at LIBOR plus 750 basis points at September 30, 2011. On October 1, 2015, the lender may adjust the interest rate spread to any percentage. Rabo must provide a 30 day notice of the new spreads, and the Company has the right to prepay the outstanding balance. The Rabo credit facility contains the following significant covenants: (i) minimum current ratio of 2.0:1, (ii) debt ratio no greater than 60%, (iii) tangible net worth of at least $80 million, and (iv) minimum debt coverage of 1.15:1. At September 30, 2011, and 2010, the Company was in compliance with the debt covenants and terms in accordance with the Rabo loan agreements. concentration account on a daily basis. Any balances in excess of $250 thousand are automatically applied to pay down the revolving line of credit. If the balance in the concentration account falls below $250 thousand, draws are made on the revolving line of credit to maintain this target balance. The Companys cash and cash equivalents balance decreased by $9.6 at September 30, 2011 as compared with September 30, 2010 due to the cash management agreement as described above. The Farm Credit mortgage note requires monthly principal payments of $106 thousand plus accrued interest until maturity. In September 2010, the Company entered into an agreement with Rabo for $100 million to refinance the term loan and revolving line of credit with Farm Credit. Proceeds from the refinancing agreement were used to extinguish the term loan and revolving line of credit with Farm Credit. The prepayment of the term loan with Farm Credit resulted in the Company incurring a one-time charge of $3.1 million and the recognition of approximately $305 thousand of unamortized loan origination fees, which were charged to interest expense during the Companys fourth quarter ended September 30, 2010. Farm Credit released collateral of approximately 43,847 acres of property used by Alicos cattle and leasing operations as a result of the refinance. (a) Interest expense for the year ended September 30, 2010 includes a prepayment penalty of $3.1 million and $0.3 million of loan fees. Effective November 1, 2008, the Companys Board of Directors authorized the repurchase of up to 350,000 shares of the Companys common stock through November 1, 2013 for the purpose of funding restricted stock grants under its 2008 Plan, which was approved by shareholders on February 20, 2009. Prior to November 2008, Alico provided incentives under its 1998 Plan, and was authorized to purchase up to 650,000 shares. The stock repurchases began in November 2005 and can be made on a quarterly basis until November 1, 2013, through open market transactions at times and in such amounts as the Companys broker determines subject to the provisions of SEC Rule 10b-18.